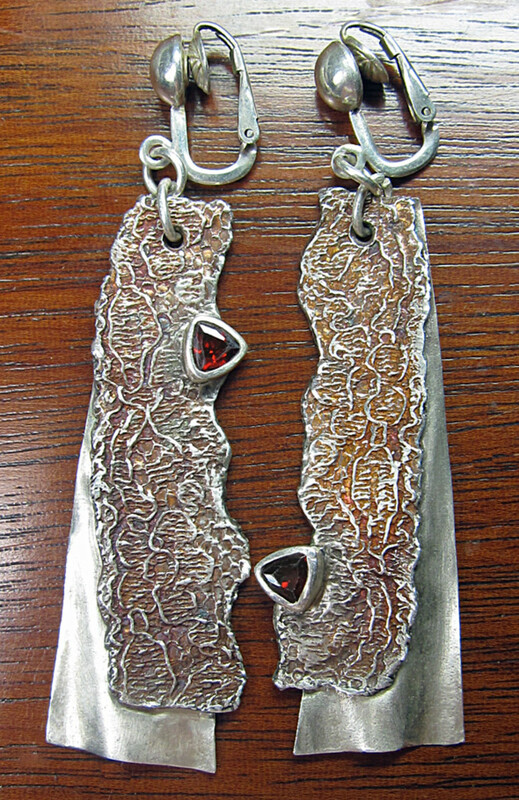 Margaret Schindel is a jewelry artist and internationally-known expert on metal clay techniques. PMC certified in 2006 by Celie Fago. This comprehensive guide includes dozens of ways to texture metal clay with a huge variety of DIY and purchased tools, texture mats, molds and stamps, found objects from nature, your sewing box, kitchen, garage or junk drawer, and more. Learn how to create your own unique stamps, molds, carving, texture mats, tear-away textures, etched copper or brass sheets, 3D dimensional paint sheets, appliqué with silver clay paper, and many other texturing methods, materials, tools and equipment. 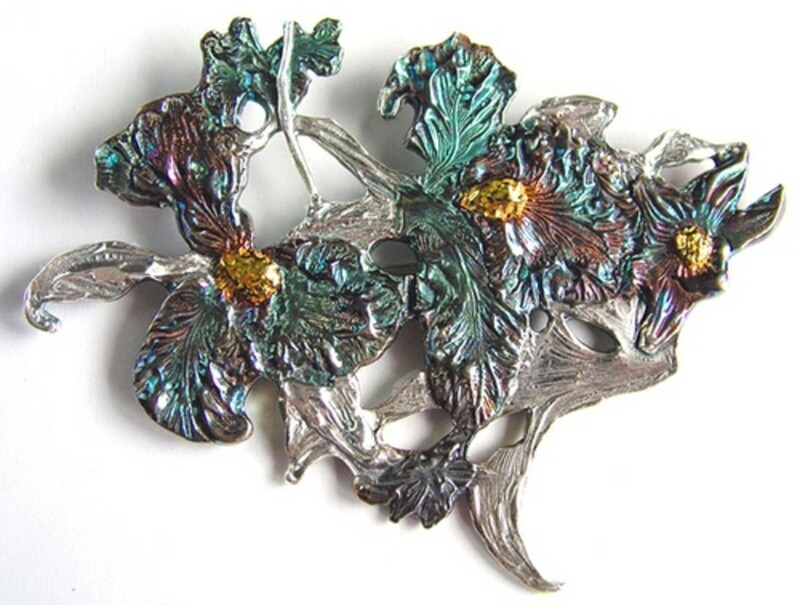 Many of these methods, materials, tools and techniques also can be used or adapted to add surface interest to your polymer jewelry, sculptures and other creations. Enjoy this wide array of methods using found objects, purchased texture plates, sheets, mats or rubber stamps and your own original, one-of-a-kind textures. Most of the texturing techniques in this guide can be used to create metal textures that would be much more difficult or, in many cases, impossible to create with milled sheet metal or cast metal. And, of course, sculpting and carving directly in milled metal are not options, but both techniques are commonly used with the malleable form of metal, metal clay. If you develop the habit of always keeping an eye out for interesting textures you'll start to look at even the most mundane objects through new eyes. 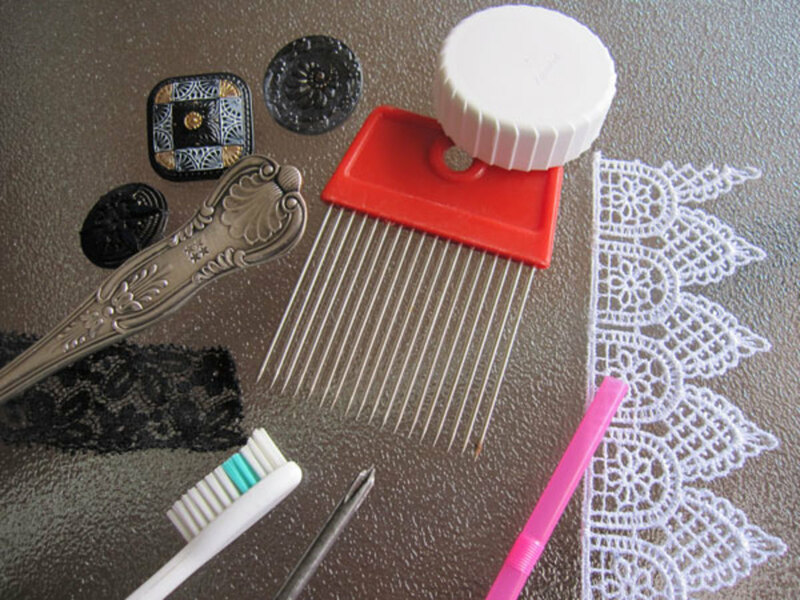 Household items and found objects, anything from a ridged toothpaste cap to a textured meat tenderizing mallet, from charms and trinkets to carved or molded antique buttons, from rubber shoe treads to ornate silverware handles can be used to texture your metal clay designs. Organic materials such as leaves are extremely popular for texturing metal clay, but many other organic materials including food can create even more interesting and unusual textures. You can texture metal clay with a wide array of commercial metal stamps, rubber stamps and texture sheets. You also can make your own unique texture sheets to create truly one-of-a-kind jewelry designs. Examples of homemade textures include carved sheets of cured polymer clay, photopolymer plates (PPP), tear-away textures, and Scratch-Foam texture plates "carved" by hand or with the Silhouette CAMEO, Portrait or Curio electronic cutting tool fitted with a gel pen, small ball-tip burnisher, or other stylus. 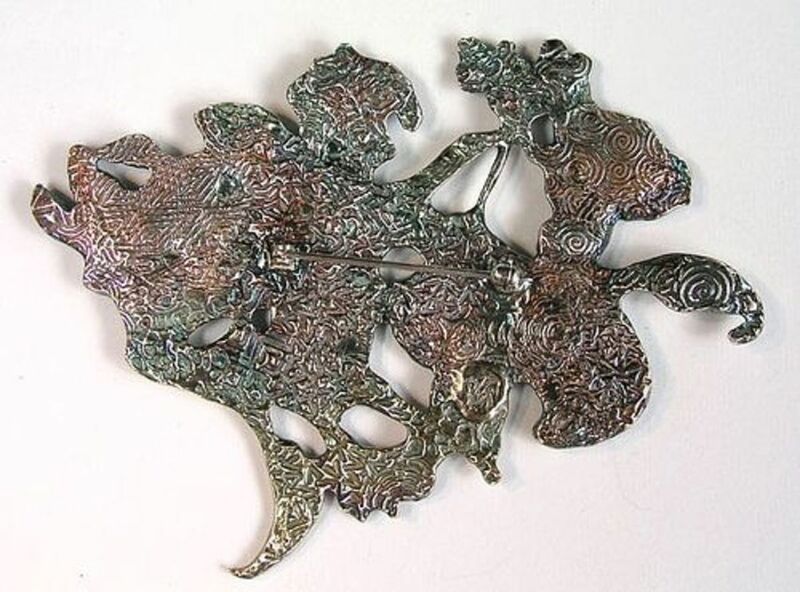 Dried metal clay that hasn't been fired yet, also called metal clay greenware, can be textured with water etching, filing, sawing, drilling, and/or carving or by using an appliqué technique to apply cut-outs from thin sheets of flexible metal clay greenware or commercial silver metal clay paper or sheet. And fired metal clay that has been sintered fully (and properly annealed, if appropriate) can be textured with traditional metal working techniques such as filing, sawing, drilling, stamping, etc. Because metal clay shrinks 8%–30% during the sintering process (depending on the type and formula of metal clay used), the texture of a piece is more pronounced after firing. The higher the shinkage rate, the more detailed the texture appears. In other words, if you impress the same texture on two sheets of metal clay with different shrinkage rates, the texture will appear to be more detailed in the sheet made from the higher shrinkage formula, although the identical amount of detail was impressed into both sheets. Once you start working with metal clay, you learn to look at even the most mundane objects —indoors or out, from your backyard to your refrigerator — as a potential metal clay texture! Use your imagination and you can find a nearly endless variety of textures for metal clay just sitting around your kitchen, bathroom, office, or garage. Polymer clay artist Natalia García De Leaniz has a wonderful free online class called "Textures Everywhere!" that used to be on Donna Kato's wonderful CraftArtEdu site (that, sadly, closed in 2017) but is still available in the archived classes on Vimeo. Natalia shares many creative ideas for using ordinary household items to create textures. Although the class is geared toward polymer clay, most of her tips apply equally to metal clay. Plastic mesh netting from bagged onions or garlic, covering citrus fruit crates, etc. Inexpensive plastic cutlery or old, unused stainless steel knives, forks and spoons for impressing metal clay with lines, evenly spaced perforations, fish scale patterns (using the tip of a spoon), etc. hen choosing texture tools from your kitchen, avoid those made of aluminum if you think you might ever use them with silver clay. I've heard some artists say they apply clear acrylic lacquer to aluminum items to prevent the aluminum from coming into direct contact with silver metal clay. However a coating of lacquer will at least craze if not actually crack or flake off eventually, and silver clay is too expensive to waste unnecessarily. So I advise staying away from aluminum tools for this purpose and thereby avoiding any risk that the silver clay might react badly with it at some point. Once you use an item with metal clay, don't allow it to come into contact with food from that point on. Dedicate it to crafting use only! Tip: Drill a hole through the center of a ridged cap, thread it into a pin tool, skewer or round toothpick, center it on you chosen "axle" and hold both ends of the rod with your fingertips to steady the cap as you roll it across the surface of a metal clay sheet. Antique or vintage lace can be sealed with a waterproof spray sealer and then impressed directly into metal clay. You also can make a reusable silicone mold of old or new lace, as I did to create the lace texture on the asymmetrical earrings shown. High quality lace, especially vintage or antique lace, can be expensive. Damaged, torn or stained lace or remnants generally are significantly less expensive than pieces in pristine condition. A piece that contains even just a few undamaged inches is fine for this purpose. And, of course, stained lace makes just as good a texture impression on metal clay as a piece that hasn't discolored. Porous materials will stick to metal clay, ruining the impression and wasting valuable clay. So if the item you want to use as a metal clay texture has a porous surface you will need to apply a waterproof sealer. To seal uncoated wood, textured paper, or similar porous surfaces, apply 3–4 light, even coats of a waterproof clear acrylic spray, allowing each coat to dry thoroughly. To seal fabric, lace, trim, knitted cotton ribbing or other textiles so you can impress them directly into the surface of moist metal clay, apply a waterproof fabric sealer (e.g., Scotchgard Outdoor Water Shield) and allow it to dry thoroughly before using the textile to texture metal clay. Thin rubber treads can have some really fun and interesting patterns. Cut them off the bottom of sneakers or house slippers to make wonderful texture sheets that create deep impressions. Thanks to Celie Fago for this idea. Adult sneakers and bedroom slippers provide the largest textured rubber surface area. But depending on the scale of tread pattern you might find that it's better to buy a particular pair of trainers or house slippers in baby, toddler or young children's sizes, whose treads usually have smaller scale patterns that are better suited to jewelry making. Also, because children outgrow their clothing so quickly, the treads on inexpensive second-hand kids' sneakers are often in good condition. Many bedroom slippers also have outsoles with rubber treads that tend to be thinner and more flexible than tennis shoe treads and often have more delicate patterns. A clean typewriter ball is great for impressing individual letters and numbers on clay, although you have to be very careful when you use it. If it is a used typewriter ball, make sure to clean it very thoroughly before using it with metal clay. 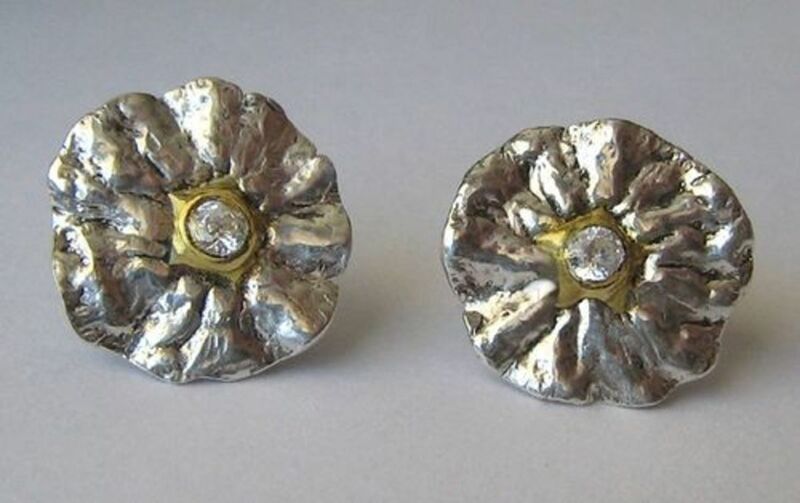 You can sometimes find unused (or used) IBM Selectric typewriter balls on eBay. Changeable date/message stamps are much easier to use than typewriter balls, especially the new magnetic ones. Make sure to clean it thoroughly before using it with metal clay. Take apart and clean an old, cheap ballpoint pen and use the barrel, the tip, the end, even the pocket clip, if it has one, to impress textures into your clay. Charms, vintage or reproduction vintage filigree stampings, gallery wire, pressed glass or molded resin new or vintage cabochons, and strands of chain or tiny beads are just some of the jewelry pieces and jewelry making supplies that can be impressed pressed directly into metal clay or molded with two-part silicone molding compound. Create a changeable rolling texture tool by lightly oiling a bead with a great surface texture, sliding it onto a needle tool or skewer and rolling it across the surface of your clay, keeping the needle tool or skewer perfectly horizontal. Or try artist, instructor and author Patrik Kusek's method for creating a simple craft wire handle to turn a textured bead into a rolling texture tool by folding and shaping a piece of craft wire and bending the tips to fit into the bead holes. Make custom tools by adding polymer clay handles for Phillips head screws, washers, beads, filigree bead caps, stampings, charms, coins, buttons, icing tips, etc. 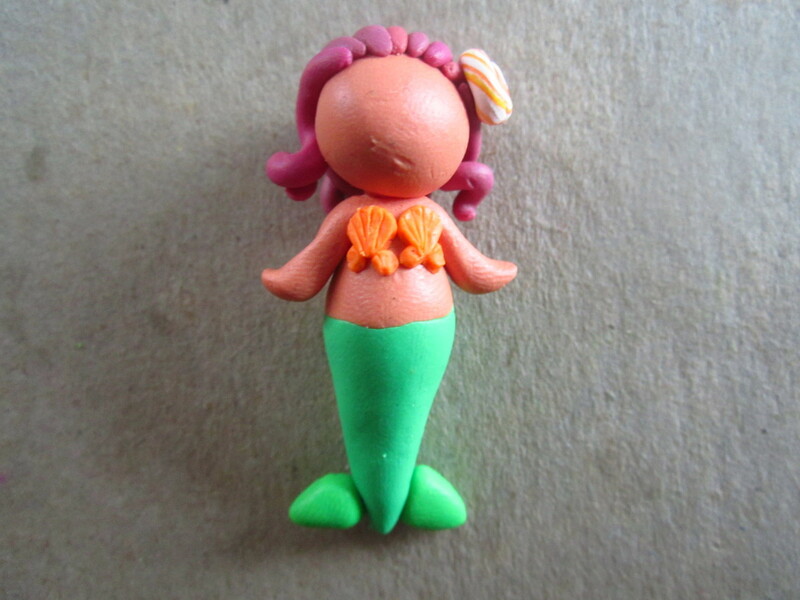 using this tutorial from Polymer Clay Web. Check out the tools you already own to see whether they can be re-purposed for texturing metal clay. 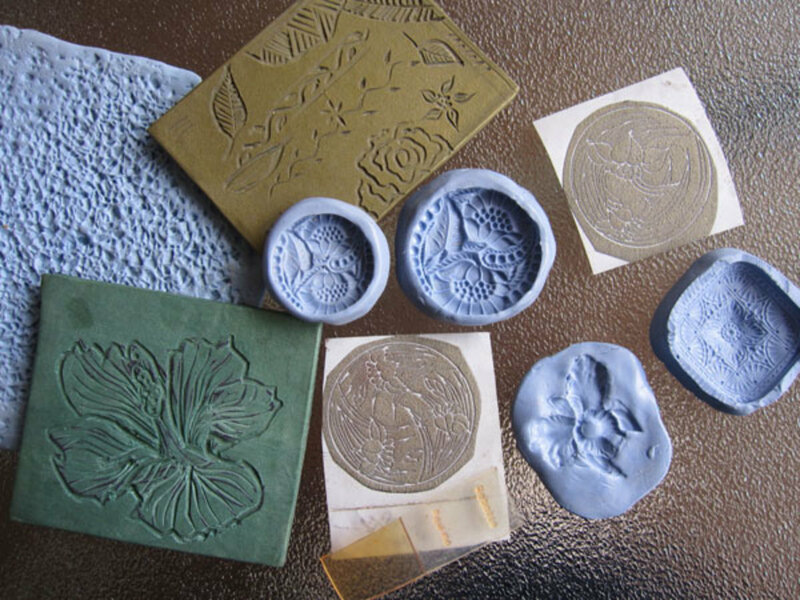 Steel stamps and leather embossing stamps can be pressed into soft metal clay. Ball stylus tips make wonderful texture tools, as do burnishers, blades, paintbrush handles and just about anything else in your metalsmithing, leather embossing and/or clay toolkit. Stippling fresh clay with a lightly oiled ball-tipped burnisher is an easy way to create an attractive surface texture. Stippling slowly and evenly with several sizes of ball burnishers can simulate a hammered metal texture. 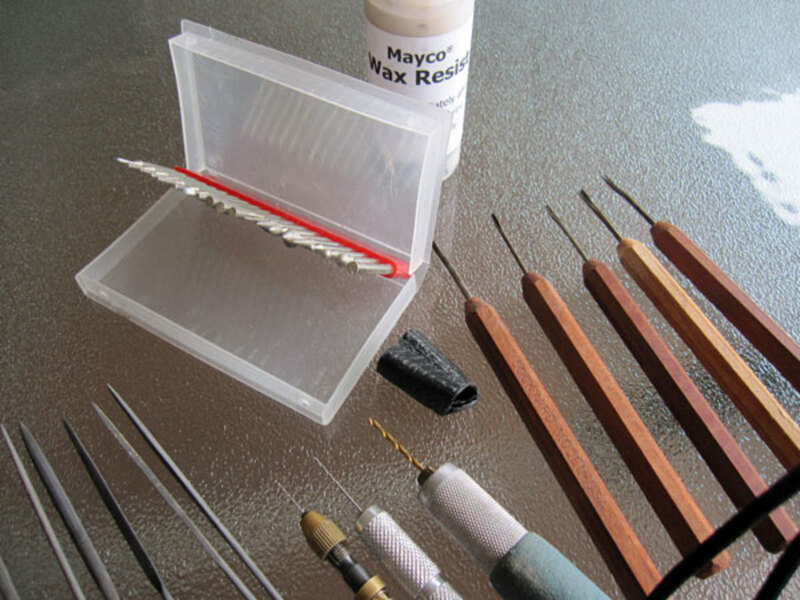 If you or someone you know enjoys needlework, you can repurpose unused tools and supplies. Plastic canvas pressed directly into the clay creates an embossed grid pattern. Mold it to create a raised grid pattern. Use knitting needles to emboss lines or stripes in the clay, or use a molding material to create a texture with raised lines or stripes. You can also use the pointed tips to emboss conical depressions or make molds to create a pattern of raised cones. 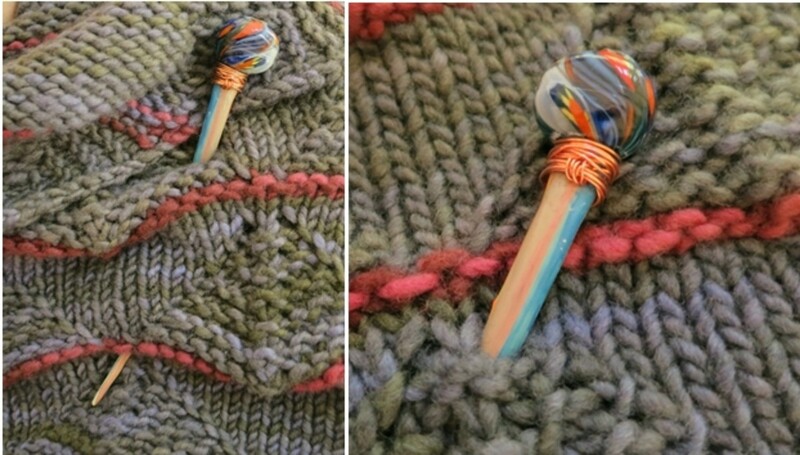 Make swirl patterns with the head of a crochet hook. You can make a row of them that look a bit like cresting waves. This is the most fun part of finding texturing opportunities. 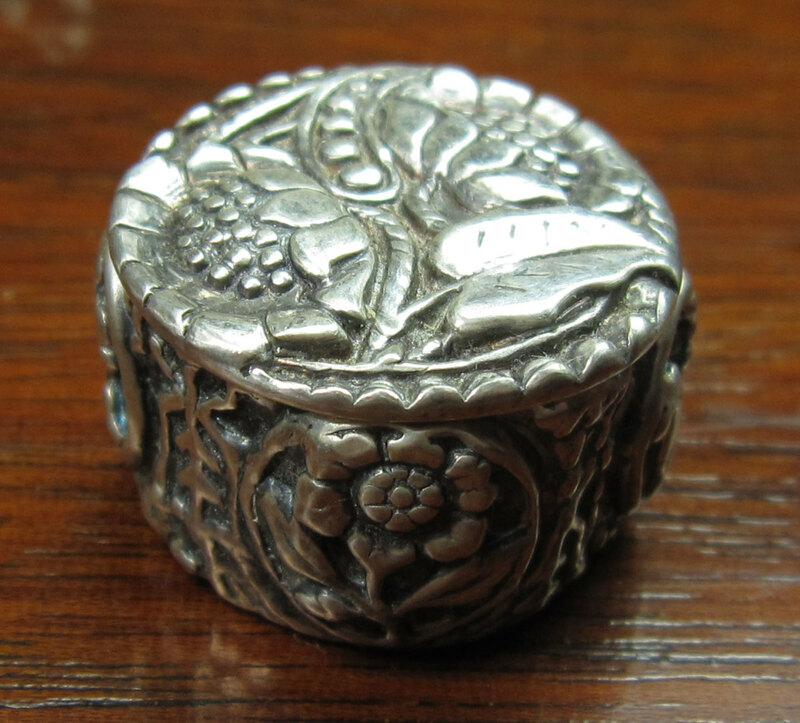 Buttons, carved figurines, dollhouse-scale miniature trims and moldings, carved boxes, thimbles, wire mesh, plastic needlepoint canvas, knobs, finials, molded or textured glass — nearly anything has the potential to be used as a metal clay texture. Start looking around your home - and at the world - through a different lens and you'll never be at a loss for texturing ideas. Lovely antique button molds can be purchased from Cool Tools and from Etsy sellers like MoldMuse and monaledwin. But you can also make your own molds from detailed, dimensional, nonporous buttons using two-part silicone molding compound. 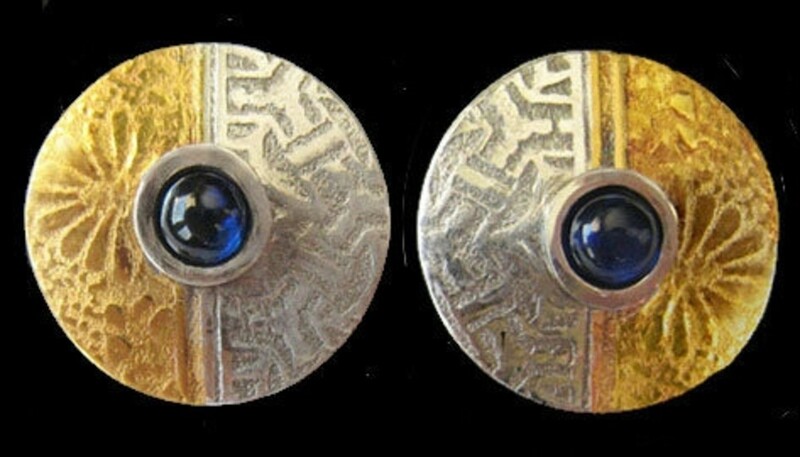 Look for nonporous buttons with well defined details for this purpose, e.g., molded glass or resin, cast metal, carved mother-of-pearl or celluloid. Tree bark, leaves, twigs, nutshells, pine needles, pine cones and seashells you find on a leisurely stroll are some of the many natural textures you can capture in metal clay, either by pressing them directly into the clay or by making reusable molds from them. Even food makes wonderful textures! Use small seashells you pick up on the beach (or purchase a bag of shells in a craft store). 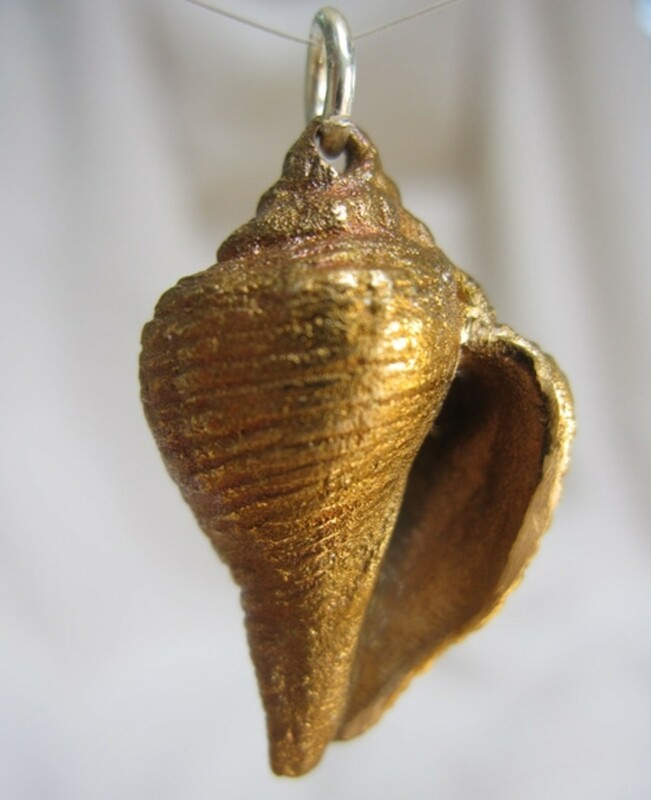 Depending on the size and shape of the shell and how you plan to use it, you can either impress the shell into prepared silicone two-part molding compound to make a simple mold or create a two-sided mold you can use to replicate the entire shell from all angles, like the seashell pendant I made from bronze clay shown above. The photo below shows my bronze beach scene charm with tiny seashells that I formed by packing metal clay into molds I made using two-part silicone molding compound. Covering leaves with layers of metal clay slip is very popular. The key to this approach is patience, thin layers and air-drying each layer very thoroughly before applying the next. Don't expect to apply all the layers in one day! However, this is using the leaf as a burn-out core, not as a texture. To impress the texture of a leaf, select one or more fairly small leaves with very well defined veins on the back. Roll out metal clay just slightly thicker than the desired thickness after texturing. (A good way to do this is to roll out the clay just slightly wider than you need, putting the rolling spacers close to the clay and using a light touch with the clay roller.) Lightly oil the back of the leaf (where the veins are most prominent) and place it face up on the clay sheet. Press the leaf it into the clay very lightly so it's less likely to move when you roll across it. Rotate the work surface 90 degrees, re-position the rolling spacers normally, and roll across the clay to impress the leaf evenly. Use a fine clay pick or the pointed tip of a sharp craft knife or scalpel to slightly lift the stem of the leaf (or the lower edge of the leaf, if there is no stem), taking care not to mar the impression, and then peel away the leaf carefully. Use a scalpel, craft knife or sharp needle tool to cut around the impression. If desired, you can drape the cut-out leaf over a support to give it a curved shape. You can also mold a leaf with 2-part silicone molding compound and use it to make multiple impressions or two-sided metal clay leaf components. Metal Clay Artist Magazine Volume 2, Issue 3 contains a tutorial by well-known jewelry artist Un-Roen Manarata from Belgium on how to make a two-part mold for molding two-sided leaves. CeCe Wire's book Creative Metal Clay Jewelry: Techniques, Projects, Inspiration included a metal clay Twig and Leaf Condiment Spoon project that was reprinted in a 2005 issue of Studio PMC magazine and is now available as a free PDF from Rio Grande. It includes very good step-by-step instructions for coating a twig in many thin coats of diluted metal clay slip, sometimes called paste. Painting slip on a twig will only capture the surface texture on the inside of the hollow metal tube after the wood burns out during firing. If you want to recreate the surface texture as well as the shape, I suggest either making a two-part mold of the twig and filling it with metal clay to create an exact replica (which will shrink during firing) or rolling out clay snakes in different sizes, using the largest one as the main portion of the twig, attaching smaller ones as branches, and texturing the surface either by applying thick slip or paste with a palette knife or by carving it with micro carving tools to resemble bark. Edibles from dried pasta to citrus peel to fresh or dried herbs and seeds can be used to texture metal clay. I shaped the flower-like silver blossom earrings shown here with a silicone mold I made of the blossom end of a tangerine. Look beyond the obvious. Breakfast cereal, corn husks, even oiled gummy candies can be used to impress textures fun and unusual patterns in moist clay. Food items that will burn away without leaving a residue, like dried pasta or rice, can remain impressed into the clay during firing and left to burn out in the kiln. The rest, including the gummy candies, should be oiled, pressed into the clay and removed, or you can make molds from them and then use the molds with your metal clay. There is a mind-boggling selection of commercial texture mats, molds, stamps, etc, available for purchase, and many of them are extraordinary. But since purchased textures also are available to any other artist who chooses to buy them, there's always the risk that someone else will end up making a piece of metal clay jewelry or objet d'art that looks very similar to one of your designs. The only way to guarantee that each of your metal clay jewelry designs is unique is to create them with custom textures and molds that you design and create yourself. 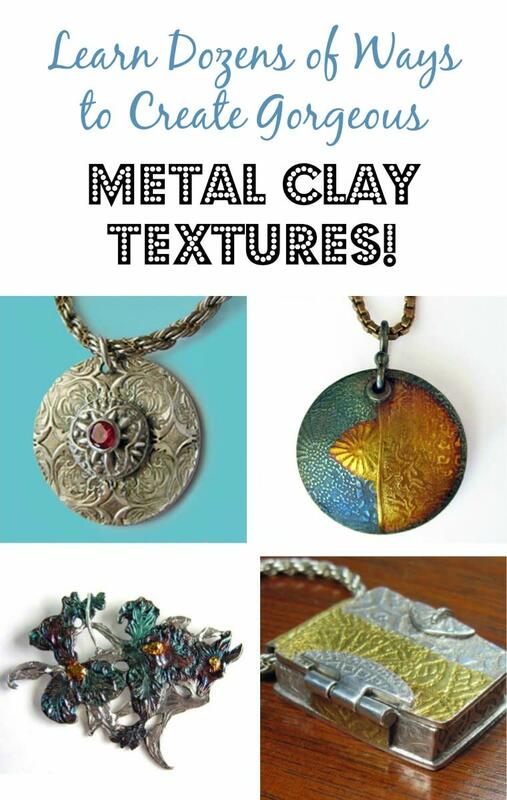 Here are some of the most popular materials and methods for creating your own metal clay texture tools as well as some lesser known but equally interesting texturing techniques and materials for making one-of-a-kind jewelry. To recreate the original, raised texture in metal clay rather than embossing the clay so that the raised areas and depressions are reversed. To reproduce a complete 3D replica of an item, front and back. To create a custom texture sheet by impressing objects into the molding material in a unique pattern. To create a reusable mold of a fragile texture, such as antique lace. 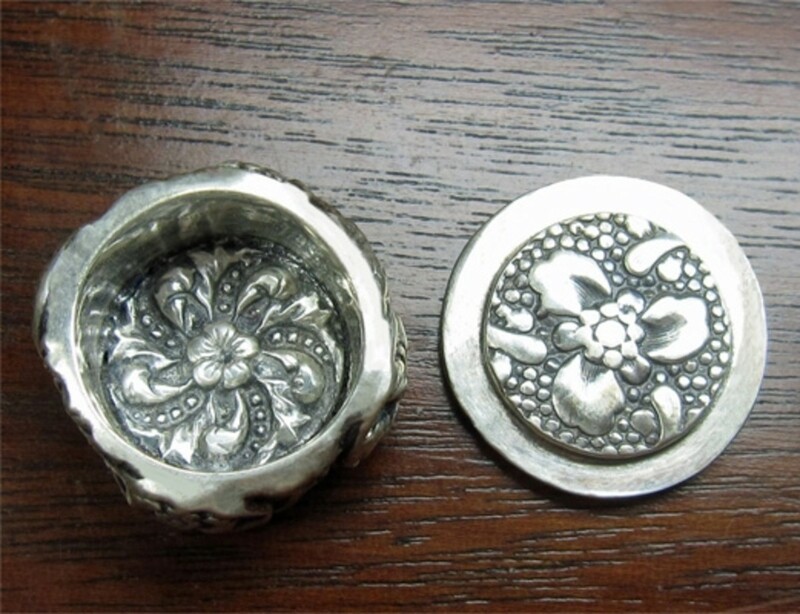 To create a reusable mold of a valuable or borrowed item, such as a piece of jewelry. Depending on your budget, how finely detailed you want your mold or sheet to be and whether and how often you plan to reuse it will influence the molding material you choose. Mix together Part A and Part B of the molding compound according to directions (generally with silicone molding putty, you mix equal amounts of Part A and Part B until marbled or, in some cases, until the mixture achieves a uniform color) and press the item you want to mold into the mixture. Note: I've had better luck when I mix the two compounds to a uniform color even when the directions say you don't need to, but it's essential to do it quickly and press your item into the mold before the mixture starts to set up. As when mixing 2-part epoxy, proportions matter! I use a set of plastic measuring spoons (dedicated to craft use) to measure out precisely equal amounts of each part. If you have to eyeball the amounts, try rolling each part separately into a ball and add or subtract amounts until both balls are the same size before you mix them together. After waiting for the curing time recommended by the manufacturer, test the mold by pressing your fingernail into the outside of the mold. If the molding material springs back immediately without leaving a dent, the mold has cured properly and you can remove your item. Each compound is a little different, so follow the detailed instructions on the packaging. Many smooth-surfaced items don't need to be coated in a release before moulding, but matte items may stick unless you first coat them with a thin layer of mold release. Spray porous objects with thin coats of acrylic spray lacquer (such as Krylon Crystal Clear) and let each coat dry thoroughly, then apply mold release before making molds. 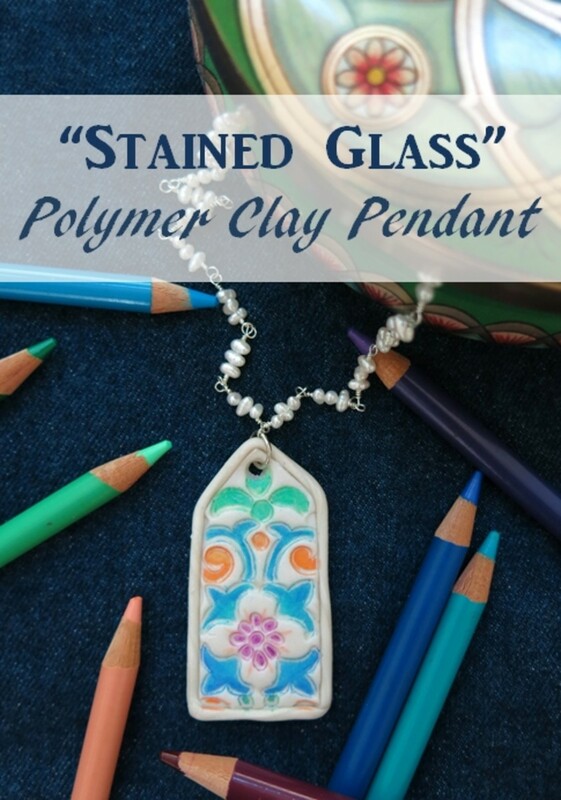 Talented polymer clay artist and teacher Ginger Davis Altman of The Blue Bottle Tree wrote an excellent tutorial on How to Make Silicone Molds from Charms that also could be used to create flat-back molds of other objects, such as brass stampings or buttons with metal shanks. Start by rolling a small, smooth ball of metal clay and flattening it into a fairly thin patty slightly smaller than the mold you want to fill. Place this patty on the mold and, using the pad of your finger, press the clay firmly into the mold. Start in the center and work your way out to the edges to avoid trapping air between the clay and the mold. Make sure that this initial clay patty isn't too small to avoid having any seam lines in the surface of the clay. If you need to add more clay to make the molded piece thicker, add it to the center of the previous layer and work it out to the edges with the pad of your fingertip. When the mold is packed to the desired thickness, gently roll the edges of the clay back toward the center with the pad of your fingertip so that the edges of the molded clay will be clean. The following video from Cool Tools demonstrates the technique visually. Making a 360-degree mold of an object is more difficult than molding just the front or back. The mold must be made in two pieces so that the original model can be removed and so that the mold can be filled with clay and then unmolded. One side of the object is embedded in an even slab of prepared two-part silicone molding putty. Then alignment keys (the equivalent of registration marks for two-dimensional layers) must be created so that after both halves of the mold have been made they can be properly aligned when the mold is opened and closed. An easy way to create alignment keys is to partially embed groups of small beads in the lower part of the mold, grouping them in different numbers and arrangements so that no two groups are alike. Instead of small beads, you can also use short segments of narrow wood dowel that have been sealed with spray acrylic, dried thoroughly, and then coated with a thin layer of petroleum jelly just before embedding them into the molding putty. If you are molding a completely symmetrical object, you can put just one alignment key in each corner. After the lower half of the mold has cured, the partially embedded beads or dowels are removed, leaving depressions in the mold. The top surface and the depressions are coated with a commercial mold release (or melted petroleum jelly). The mold release prevents the upper half of the mold from bonding to the lower half of the mold. Freshly prepared molding compound is added to mold the top half of the object and fill the alignment key depressions. When the upper half of the mold has cured, the halves of the mold are separated and the model is removed. For some molds, it may be preferable to embed the model halfway into a bed of non-hardening modeling clay along with the alignment keys and then form the first half of the mold on top of that clay bed. Do not use modeling clay containing sulfur! Make Your Own Molds has a helpful tutorial for how to embed a model in clay for making a two-piece mold. (Safe-D-Clay is the company's own brand of modeling clay and Release-Dit is its brand of mold release.) Once the first half of the mold has cured, peel away the clay, remove the alignment keys, apply mold release to the newly exposed surface of the mold, and then add freshly made molding compound to mold the other half of the model. Pourable liquid silicone molding material may be a better choice for making two-piece molds of very detailed objects. The following video from Smooth-On provides an excellent demonstration of how to make a two-piece mold using pourable silicone. There are many different types, brands and formulas of mold-making material that is suitable for making molds and texture sheets for use with metal clay. Some popular brands of 2-part molding compound include Castaldo Quick-Sil, Cold Mold, Belicold, Puffinalia's Miracle Mold, Mega-Sil, Silicone Plastique, Alley Goop and HattieS. Art Clay World also sells its own brand of 2-part silicone molding compound. My personal favorite is Knead-a-Mold by Townsend Atelier - not inexpensive, but it captures amazing detail. Before buying or using any of these 2-part molding compounds, make sure you check the packaging to find out how long the pot life (working time) and curing time are for that particular brand and formula, since these times can vary significantly. The length of the pot life and the curing time usually (but not always) are related; if you want more time to perfect your mold, usually you'll need to wait longer for the mold to cure. Why would you want more working time if it means waiting longer for the mold to cure? Especially if the object you're molding has a lot of details, you'll get the best results by applying a "skim coat" of putty a little at a time over the entire surface to be molded. Starting by pressing just a small amount of putty firmly into the details at the center of the object, pushing the putty out from the center in a thin layer so no air is trapped underneath. Then add another small piece of putty on top of the leading edge of that layer and then pressing it outward into the adjacent area, pushing out the air as you press it into the object's details. Continue this way, working from the center of the object out toward the sides, until the entire piece is covered with a thin layer (skim coat). Then make the molding putty into a thick patty, press it around the object on top of the skim coat and set it aside for the recommended curing time. Don't miss the superb four-part video demonstration by Chef Dominic Palazzolo (further down in this article) on how to make a lace mold using Silicone Plastique food-grade molding compound, which has a long pot life (and requires a commensurately long curing time). Working time: No more than 1 minute. Cure time: 6 minutes. Food grade. Best for simple molds that don't need much finessing because of short working time. Molds are ready to use quickly. Working time: 3 minutes. Cure time: 20-25 minutes. Cured molds will withstand temperatures up to 395 degrees F. If kept at cold temperatures for an extended time, warm cured molds to 70 to 100 degrees F.
Working time: 16 minutes. Cure time: 20-30 minutes at 70-72 degrees F.
A thick liquid version of Knead-a-Mold. Can be brushed on to capture fine detail (even on skin, such as fingerprints). Build up in thin layers. After curing, add Knead-a-Mold, which will bond with it to build up to desired thickness. Do not over-mix! If you do, the material will not cure properly. Working time: 2 minutes. Cure time: 30 minutes. Designed to be used with a mold frame. Working time: 6 minutes. Cure time: 6 minutes at 70-72 degrees F.
Food grade. Reproduces even very fine detail. Molds can be baked at up to 300 F constant temperature or 600 F intermittently. Working time: Not specified. Cure time: 5 minutes. Picks up detail very well. Available as small, single use SOLOS that require no measuring and are easy to carry around so you're always ready to take an impression of any interesting texture you encounter. Note the short shelf life, however: 3 months. Working time: 1-2 minutes. Cure time: 10-15 minutes at 72 degrees F.
Working time: Not applicable. Cure time: Bake at 275 °F (130 °C) for 15 minutes per 1/4 inch (6 mm) thickness. Sculpey Mold Maker is a ready-to-use polymer clay mold making material. It is convenient and inexpensive, but not as flexible when cured as silicone. I find it is best for making molds without fine details. Working time: 10 minutes. Cure Time: Approximately 1 hour. Food grade. Molds can be frozen without losing flexibility and resist temperatures up to 450 degrees F. Long working time is ideal for very detailed molds (such as antique lace) that must be built by adding small amounts of molding putty at a time. Working time: 30 minutes. Cure time: 75 minutes. OOMOO 25 is a liquid silicone mold making material that is suitable for capturing extremely fine details. Be sure to pre-mix (stir thoroughly) both parts before mixing them together. Two-part silicone molding compounds have a very limited shelf life! Don't buy more than you think you'll be able to use up within three to six months. You can buy individual / single use size containers of Parts A and B, but it costs less to buy the molding putty in larger quantities and measure out equal amounts into inexpensive airtight containers, such as Buddy Cups or air-tight paint storage cups. I recommend buying a set that includes multiple sizes so you can bring along larger or smaller quantities of each compound part depending on your plans for the day. For everyday purposes a very small container of each part is enough to allow you to capture unexpected texture finds. If you're going somewhere specifically to look for new textures to mold, you may want to bring along somewhat larger jars of Part A and Part B. After the cups are filled and snapped shut, I like to wrap the seam between each cup and its lid with a taut strip of 1/2" wide electrical tape to make sure the lid can't loosen or come open in my pocket, tote bag, briefcase or purse. Chef Dominic Palazzolo, creator of Silicone Plastique two-part molding compound, has created a wonderful and comprehensive step-by-step video tutorial for molding a piece of lace appliqué. To capture all the details in the lace, you'll want to choose a molding compound with a long open/working time. This superb video tutorial includes professional tips for ensuring a perfect result. Because it is long, it is broken into four parts. I've shared Part 1 of the video series below. If you click the YouTube icon at the bottom you can watch it on YouTube and the next part in the series will display in the right-hand column, which makes it easy to watch all four parts one right after the other. Watch these Cool Tools video demonstrations to learn how to trim silicone molds and create conforming dies that allow you to use significantly less clay. MagicStamp is a heat-sensitive, reusable, moldable foam material. Heat it according to directions, press in the object whose texture you want to capture and let it cool. When you're done with your mold, reheat it and press in a new object to create a different mold. Oyumaru is another reusable molding material that is softened by heat. Dip it into hot water for 3 minutes, remove it with tongs, wipe it dry and press the item to be molded while the Oyumaru is still warm and soft. If it hardens before you have finished impressing the texture, just put it back into the hot water to soften it again. Create Your Own Unique Texture Plates with Scratch-Foam Foam Printing Boards or Recycled STYROFOAM Food Trays. When Wanaree Tanner read a post on Alisa Burke's blog about "carving" (embossing) designs into sheets of extruded foam sheet such as Scratch-Art Scratch-Foam foam printing boards with a chopstick, paintbrush handle, or other improvised stylus to use for block printing fabric, she immediately was inspired to try embossing some of her own designs onto Scratch-Foam sheets and using them as deep-relief textures for metal clay. Her amazing sterling silver shield rings shown above were made by texturing PMC Sterling silver clay with some of her first Scratch-Foam textures. This technique allows you to create your own deep-relief textures from your drawings, sketches, and Zentangle or other patterns quickly and inexpensively, especially since you can substitute clean, recycled STYROFOAM type food trays that otherwise would end up in the trash. Read on to learn about using the Silhouette Cameo electronic cutting tool to emboss Scratch-Foam for deeper and more intricate texture sheets. Use the Silhouette Cameo with Scratch-Foam Sheets to Create Deep-Relief Metal Clay Texture Sheets. The Silhouette CAMEO electronic cutting tool is allows you to create intricate textures in metal clay. One of the ways to use this electronic die-cutter is to replace the cutting blade with various types of stylus tools, ballpoint pens or gel pens to impress deep relief textures into Scratch-Foam foam printing board sheets. Deep-relief texture sheets are also good for creating walled cells to fill with enamel, which is what Wanaree did to create the beautiful silver piece with champlevé enamel shown here. If you're interested in either of these uses of the Silhouette Cameo with metal clay, ask to join the Facebook group MC SILies, where metal clay artists share their ongoing explorations, experiments, lessons learned, and tips for using the Silhouette CAMEO as a metal clay tool. Once you create a simple set-up with a UV light (available at Lowe's, Home Depot, etc., or you can use a manicurist's UV nail gel curing lamp from a beauty supply store like Sally Beauty Supply) and purchase the special sheets of photopolymer plate material, creating your own custom texture plates or stamps from black and white artwork is a quick and easy. Basically, you copy your image onto a piece of acetate (overhead transparency sheet), reverse the transparency photocopy so the design is backwards, lay it over the photopolymer plate, cover it with a piece of glass and back it with a cushioning of thin bubble wrap (or foam) Clamp the "sandwich" together with bulldog clips and expose the top to UV light to harden the parts of the design that are transparent, then scrub out the soft, unexposed material (where the design was black) under barely tepid water with a brush. Expose it again to harden the newly washed-out areas, brush with vegetable oil, and you've got your own, one-of-a-kind texture mat or stamp. A detailed photopolymer plate making tutorial, including a test strip for determining the correct exposure times for your individual setup, and an illustrated PPP demo are available on Maggie Bergman's wonderful site. Art Clay World has another excellent photopolymer plate tutorial. Polyester-backed PPPs tend to curl at the edges and dry out over time more than the steel-backed photopolymer plates. If you get steel-backed plates, however, be careful not to cut yourself accidentally on the edges (you can tape the edges to protect your fingers, if you like). Buy thinner or thicker photopolymer plate material depending on how deep you want your texture plate to be. Try to make your image pure black and white with few, if any, gray areas for the crispest texture. If you are using Photoshop or Photoshop Elements image editing software, you can create an adjustment layer, select Threshold as the adjustment layer type, and then use the slider to adjust the black/white balance until you get the clearest, most detailed image. Wherever the image/drawing is black, the photopolymer material will not be exposed and will be washed out, leaving those areas on the metal clay raised, and the areas that are white (i.e., clear on the transparency) will be exposed and hardened and will not be washed out, so the white areas will be impressed into the clay, i.e., the white areas will create the recessed areas of the impressed texture. Think about whether you want the black lines or areas to be raised or recessed; if you want them to be recessed, scan your drawing into an image editing software application (such as Photoshop Elements) and use the Invert tool to reverse the black and white portions of the image. The finished photopolymer plate texture will impress the mirror image of your drawing or image, so if you care about that (and especially if you are making a PPP of text or of a photograph), you need to have the mirror image of your design on the transparency. You can either use the image editing software to flip the image horizontally before printing it, or you can just print the image as is onto the transparency and then place the transparency face down on the photopolymer plate material, so that the text, face, etc., appears in mirror image. Make sure you print on the correct type of transparency film for the type of printer you're using (or have the transparency made at a copy shop). If you are printing onto the transparency sheet on a color printer or photocopier, adjust the printer profile setting to use black ink only, and use the finest/darkest print setting. A laser printer or copier will provide better results than an inkjet printer or copier. If you need to use an inkjet printer, print out two (or even three) identical copies on transparency film, align the layers so the image is as crisp as possible, and then tape or glue the corners to make sure the layers of transparency film can't shift. Then use these stacked transparencies when you expose your photopolymer plate. Tear-away is wonderful technique was invented in the mid-1990s by legendary polymer clay artist Gwen Gibson (who, sadly, passed away in September 2013) and was further developed and refined by renowned metalsmith, teacher, and polymer and metal clay artist Celie Fago to produce more consistently reliable results. Low-relief, shallow tear-away textures without sharp edges are perfect for texturing metal clay that will have 22K to 24K gold foil accents applied using the ancient Korean keum-boo method based on diffusion bonding. Sculpey III used to be the polymer clay formula of choice for making tear-away textures until Polyform and other manufacturers removed phthalates from their clay formulas. Celie spent a long time experimenting to find a successful alternative. She now uses a blend of Premo polymer clay (also manufactured by Sculpey, but a much stronger formula) in a ratio of one 2-oz. block of White to 1/32 of a 2-oz. block of Gold (i.e., "a good-size pinch"). Many thanks to Celie for generously sharing her reformulated recipe! Celie provides detailed instructions for the tear-away technique in her wonderful book, Keum-Boo on Silver. Just remember to replace the Sculpey III clay with a blend of Premo polymer clay — one 2-oz. block of White Premo with 1/32 of a 2-oz. block (a generous pinch) of Gold Premo. You can purchase Keum-Boo on Silver directly from Celie or from several major metal clay suppliers. Be sure to purchase the "revised and expanded" edition. Creating a tear-away texture starts with a black and white toner-based (laser) printed or photocopied image on white gloss copier paper. The image needs to be true, solid black against true white (no grayscale), so that there is sufficient toner to "grab" the polymer clay. Also, if the image is not symmetrical, it should be reversed (flipped) in a digital image editing program so that it appears backward on the printed or photocopied toner image. The sheet is trimmed to a manageable size (2.5" x 3.5" or smaller is a good rule of thumb) plus an extra 1/2" in length that you fold back to create a pull tab. A conditioned polymer clay blend (one 2-oz. block of White Premo Sculpey mixed with 1/32 of a block of Gold Premo Sculpey) is rolled out through the thickest setting of a clay-dedicated pasta machine. The resulting clay sheet is trimmed to a little larger on all sides than the trimmed image and laid on a sheet of plate glass (with edges ground smooth for safety), making sure that no air bubbles are trapped between the clay and the glass. The edges of the clay sheet are pressed down onto the glass to ensure a firm attachment when the burnished printed or copied image is torn away later on. The trimmed image is placed face down on the clay sheet and burnished very thoroughly with either the flat of your hand or the heel of your hand for 1 to 2 minutes, working from the center out toward the edges to avoid trapping any air between the paper and the clay. The glass sheet with the burnished paper and clay is placed under a task lamp with an incandescent or halogen bulb to warm the surface and help the toner bond with the polymer clay. (It's a good idea to write the time on the folded back "pull tab" just before you slide the glass assembly under the lamp for the first time so you can keep track of how long it's been warming, especially if you are making more than one tear-away texture at a time.) The image is re-burnished onto the clay periodically until the surface of the paper and clay are warm but not hot (which would mean that the clay was beginning to cure) and the toner image becomes darker and more clearly visible, usually about 20-45 minutes total, depending on the ambient temperature and humidity. Tear-away textures will develop faster in hot and humid/damp weather than in cold, dry weather; it's useful to start with an image of which you have a duplicate so that if the first tear-away doesn't come out well, you can use the back-up image to make another and adjust the rest time under the lamp and/or the distance from the warm light bulb accordingly. Experiment with the times and temperatures; you'll get a better feel for what's needed with practice. The assembly is removed from under the lamp, allowed to cool for about 30 seconds and then the image is ripped away from the clay, holding the folded back "pull tab" firmly and ripping it off the clay sheet "low and fast" (as you would when removing a Band-Aid). The thin layer of polymer clay that has bonded to the toner creates a raised image on the paper, which rolls up like a scroll when it is ripped away from the clay sheet. The rolled up paper is baked according to the polymer clay package directions to cure the clay and then flattened under the sheet of glass, if desired. It is common to make multiple tear-away textures in the same session and then bake them all at the same time. It's a good idea to apply a very thin film of olive oil to the surface of the clay rather than to the texture. With repeated use, eventually a build-up of oil will work its way underneath the clay and toner and cause them to pull away from the paper, at which point you'll need to make a new texture sheet from the original image. Applying the release agent to the clay rather than directly to the tear-away will prolong the texture's useful life by reducing the amount of oil that is absorbed by the paper. Tear-away textures are approximately 1 card (0.25 mm) deep, so if you are texturing only on side of the clay, roll the clay out 1 card thicker than you want the textured sheet to be. Oil the clay sheet very lightly, place the tear-away texture face down on the clay, and roll it out again to the desired thickness. For example, to texture the clay to 4 cards thick, roll it out to 5 cards thick, oil it lightly, then place the texture face down on top of it and roll it again to 4 cards thick. If you are texturing both sides of the clay, roll it out 2 cards thicker than the desired finished thickness, lightly oil both sides of the clay and then lay it on top of one tear-away. Place the second texture face down on the clay and roll again out to the desired thickness. For example, to create a clay sheet with a double-sided texture 4 cards thick, roll out the clay to 6 cards thick, oil it lightly, create the texture-clay-texture sandwich and roll it again to 4 cards thick. Sculpey Mold Maker (originally named Sculpey Super Elasticlay MOLDMAKER) was designed specifically for making one-sided flexible push molds. The clay needs to be baked before using the mold and it doesn't take detail as finely as the 2-part molding compounds, but it's also far less expensive. Roll out an even sheet of Sculpey Bake & Bend clay, impress it with the desired texture and cure it in the oven to make a thin, flexible texture sheet. It's an ideal way to make a texture sheet from pieces of old lace or even a stack of stuck-together paper doilies, as Carolyn Good demonstrates in her excellent flexible Bake & Bend texture sheets tutorial on the 2 Good Claymates blog. Items that can withstand the baking temperature for curing the flexible polymer clay formulas, i.e., Sculpey Mold Maker and Sculpey Bake & Bend, can be embedded in the clay to create the molds or texture sheets and baked while still embedded to retain maximum detail, and then removed from the cured clay mold or sheet after baking. You can make a reusable texture sheet by rolling out a slab of conditioned polymer clay (I recommend Premo Sculpey, not Sculpey III), pressing or rolling in a texture (anything from denim to lengths of chain to alphabet pasta) and curing the polymer clay according to the package directions. Another way to make a texture mat by sliding a bead with an interesting surface onto a needle tool and rolling it across the surface of the conditioned polymer clay before baking it. 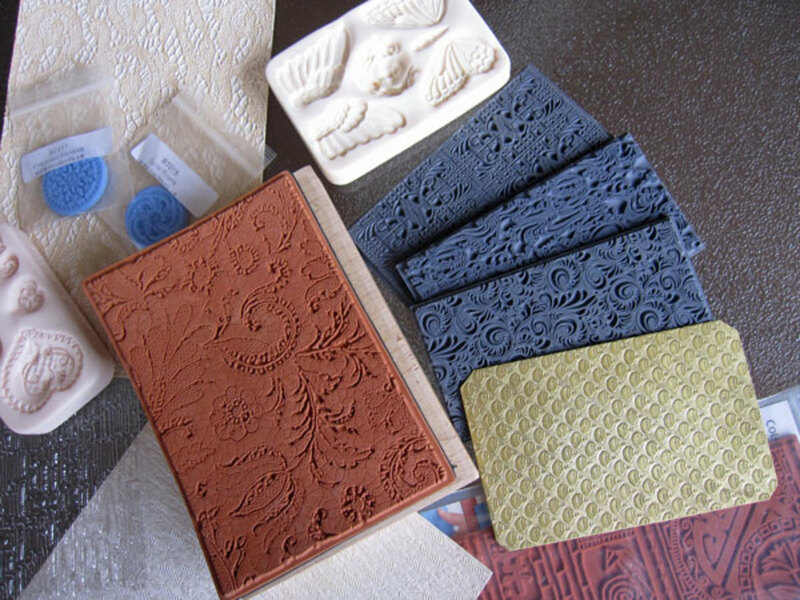 You can use knives, files, woodcarving or linoleum gouges to carve your own textures from smooth, flat sheets of baked polymer clay, wax tablets used for jewelry casting, rubber carving sheets, even erasers! Tip: Don't try to re-carve over your lines - the resulting image won't have clean edges. I like mixing colored and metallic Premo polymer clay into a homogeneous mixture, conditioning it well and rolling it through the thickest setting of my pasta machine (dedicated to polymer clay use only! ), cutting it into rectangles (usually around 3" x 4" or so, although they can be any size you like), baking them perfectly flat and then carving the flattest/smoothest side with micro carving tools. The Dockyard micro carving tools are the sharpest and best I've ever used, and I recommend them highly. However, the manufacturer plans to cease production late in 2014. Celie Fago wrote a wonderful blog post about making and carving your own polymer clay texture sheets as well as another excellent post about different types of carving tools that includes some additional tips on carving polymer clay texture sheets. Cure the textured, trimmed sheets of polymer clay at the manufacturer's recommended temperature and time. I like to bake mine for at least 30-45 minutes for maximum strength, but it's essential to use an oven thermometer to make sure the temperature inside your oven doesn't spike significantly above the recommended curing temperature during the baking period. After the clay has cured, open the oven door and allow the clay to air cool to room temperature. If desired, sand each texture stamp in a container of water to which you have added a squirt of liquid dish soap, first with 600-grit wet/dry sandpaper and then with 400-grit wet/dry sandpaper, being sure to rinse out the sanding container thoroughly and refill it with fresh water and dish soap before switching to the next sandpaper grit. Talented polymer clay artist Aniko Kolesnikova of Mandarin Duck created a fabulous, fun, fast-paced video in which she demonstrated 50 different textures she made on trimmed sheets of polymer clay using only ball-tipped burnisher tools in various sizes. The action is shown in high speed in order to fit the 50 mini demonstrations into an 11-minute video, so you may want to watch it more than once to see how she creates certain texture designs. But mostly I encourage you to use it as an inspiration for creating your own polymer clay textures with ball burnishers and other simple tools. Enjoy! 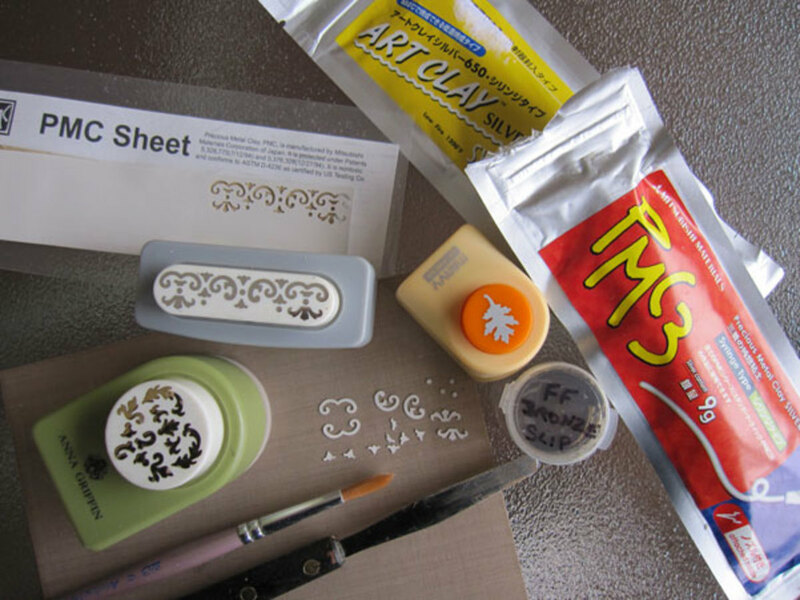 I learned about this cool, inexpensive way to make your own custom name and texture stamps in a Polymer Clay Central article by Kathy Canuel. Roll out conditioned polymer clay (scrap clay is fine!) approximately 1/8" thick (use the thickest setting on your polymer clay-dedicated pasta machine, if you have one). Find a thin knitting needle, a small ball-tipped stylus, a firm, pointed Colour Shaper, or another pointed tool that will make an impression on the clay rather than slicing or tearing into it, and use this tool to draw a light impression of your texture or name on the clay sheet as a guideline. Important: If you are making a stamp of a name or an asymmetrical texture, make sure to draw the mirror image of the design into the clay so that the stamp will make an impression that is oriented correctly! Condition more polymer, roll it into a compact cylinder, place it in the barrel of a clay extruder, and extrude a long snake, using the smallest-diameter round extruder disc/die. Lay the extruded clay snake along your impressed design, slicing it with a sharp craft blade or clay blade and repositioning the rest of the snake as needed to cover all the lines in your impressed guideline. Press the snake very gently against the clay sheet as you form each letter or design line, using just enough pressure to adhere the snake without flattening or distorting it. (If you have difficulty getting the snake to adhere to the backing sheet with minimal pressure, try applying a very thin line of liquid polymer clay over each impressed guideline on the backing sheet and then lay the snake segments over the liquid clay lines.) Note: Don't worry if your snake doesn't follow the impressed guidelines exactly. Just make sure you are happy with the way the adhered snakes look. If you don't like them, just recondition all the clay and start over. Trim around the design neatly with a clay blade or shape cutter, leaving an ample border of backing sheet around the outer edges of the snakes. Roll some more conditioned clay into a large oval that is twice as long as you want the handle of the stamp to be. Wrap the oval in plastic wrap and chill it for a bit to firm it up (say, 20-30 minutes), then remove it from the refrigerator, unwrap it, and slice it in half crosswise. Use one half for the handle of the stamp (reserve the other half for another project). Press the cut end of the handle against a hard, flat surface that has been spritzed with water (which is a release agent for polymer clay). Press down from the top with your curved palm, and then squeeze the sides with your fingers, leaving the top of the handle rounded. This forms a handle that will conform to your own fingers so it will be comfortable for you to hold. Place both pieces on a ceramic tile, with the snakes facing up and the handle standing up on its base. Cure both pieces in an oven that has been preheated to the temperature recommended by the manufacturer for the brand of clay you are using. Bake them for the length of time recommended for 1/4" thick pieces (even though your stamp face is thinner and your handle is thicker than that). The pieces will be cured again in a later step, which will allow the handle to cure fully. Use a curing oven dedicated specifically to polymer clay/craft use, or if you will be using your regular oven, place the tile inside a deep disposable aluminum foil pan, cover the pan with a sheet of heavy-duty aluminum foil, and crimp the foil tightly around the edges of the pan before putting it into your oven. After the curing time is complete, open the oven door, turn off the oven, and allow the pieces to cool slowly to room temperature. When the pieces have cooled completely, use a sharp, sturdy tool (such as a heavy-duty needle tool) to scratch a cross-hatch pattern into the back of the stamp face where the handle will be attached and also into the bottom of the handle. This will help the liquid clay bond the pieces together more securely. Squeeze a small amount of liquid polymer clay into the center of the etched area on the back of the stamp face and spread it thinly and evenly over the etched area, leaving a narrow border uncovered around the edges of the etched area. You want to use just enough liquid clay so that when you set the handle on top and press down hard, just a little oozes out all the way around the edges of the handle. If you push down hard on the handle and don't see a thin line of liquid clay oozing out around all four sides of the handle, twist off the handle, apply a tiny bit more liquid clay and try again. Keep the hard pressure on the handle for about 10 seconds, or until the components remain well attached when you pick up the stamp by the handle. Important: Do not use so much liquid clay that a lot oozes around the edges! You don't want to risk getting any it down the side or onto the face of the stamp. In this case, less definitely is more. Cover the ceramic tile with a thick layer of polyester quilt batting and nestle the stamp gently on top of the batting. Cure the stamp in a preheated oven for 30 minutes and allow the clay to cool slowly, as before. To test your stamp, roll out a slab of scrap polymer clay, spritz it with water (as a clay release agent) and impress the stamp gently. You can use this stamp to impress any type of clay — metal clay, polymer clay, etc. — as long as you use the correct release agent with it. As with any stamp, be sure to clean it thoroughly before using it with a different type of clay. Enjoy! Texture rollers are perfect for texturing clay that is longer or wider than commercially available texture sheets or stamps because they create continuous patterns. Sometimes you can get interesting effects by rolling them over the clay in several different directions, layering the pattern. To create a hot glue-patterned texture roller, start with a length of PVC pipe at least 8" long, which will leave at least a 4" wide center section for the texture. Draw a line around the circumference of the PVC pipe approximately two inches in from each end. You will be leaving the ends of the roller plain to make it easier to roll the texture across the clay. Create two temporary "feet" to hold the ends of the roller stable and elevated while you are applying the hot glue. The easiest way is to roll two large balls of conditioned scrap polymer clay, spritz the ends of the PVC roller with water so they won't stick to the clay, place a clay ball under each end of the pipe and press down lightly to create a trough so the pipe doesn't roll around. Use a hot glue gun to apply designs to the center section. You may want to draw the design on the roller with a permanent marker first to use as a guide or trace a drawing or printed computer graphic onto the roller. Drizzle freeform designs, apply the glue in evenly spaced or random patterns or cover your marked design with lines of hot glue. Don't forget to apply a clay release agent when using your hot glue texture roller. Adjust the amount of pressure on the glue gun trigger and the height and speed at which you move the nozzle over the paper, vinyl, etc., to control the width and thickness of the extruded glue, much as you would do when extruding syringe clay. Use a hot glue gun to create unique texture sheets. Hot glue is inexpensive, hardens quickly, and can be drizzled, dotted, swirled, etc., over coated paper, coated cardstock, vinyl wallpaper, or cured sheets of polymer clay to create dimensional designs that can be impressed into metal clay or polymer clay. Don't forget to use a clay release agent with your hot glue texture sheets. Many printing companies will take black-and-white artwork you supply and turn it into a custom rubber stamp for you (be careful not to give them copyrighted images that you don't own!). I recommend sending your artwork to ReadyStamps, a division of the United Cerebral Palsy Association of San Diego. ReadyStamps provides excellent-quality rubber stamps as well as employment and training to people with disabilities, so you get a great product while also helping promote the independence of disabled workers. Make sure when you order your stamp to ask for the plate and matrix with which it was made as well as the rubber stamp itself. These are terrific texturing tools and really give you a bang for your buck! It is possible to create permanent texture plates from brass or copper sheet metal by applying a resist to the metal that you want to remain raised and then etching away the exposed areas of the metal. 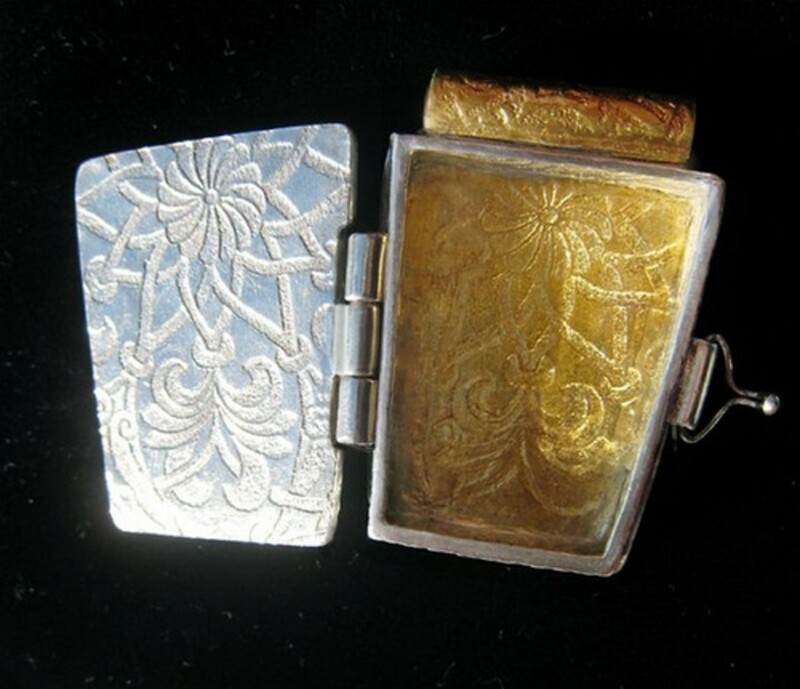 (You also can use this technique on silver to etch sheet metal as a jewelry making material, using different etching chemicals.) This gives you control over how deep you want the etch to be, and the texture plates will last indefinitely. You can also get shallow textures similar to tear-away textures, except that the edges of the etched metal textures are crisper than those of polymer clay tear-away textures. Most of the mordants (the chemicals that eat away at the metal) are potentially dangerous and must be handled with care and disposed of properly.There is an excellent step-by-step how-to article by Mona Clee in the November 2006 issue of Art Jewelry Magazine about etching brass or copper texture plates with PnP (Press n Peel) paper and ferric chloride. If you don't own the back issue, you can purchase the article individually as a PDF download. Artist, author and teacher Sherri Haab, who sells the E3 Etch System she and her husband developed, has published some very helpful metal etching information and a video demo of her E3 Etch System. There also is an excellent 2004 article on "Better-Safer Etching" on by Gail Nelson on The Ganoksin Project site. Linda Woods, a teacher at St. John's Lower School in Texas, has written a simple, step-by-step teaching lesson plan/tutorial on etching copper or brass sheet. And there's an excellent saltwater etching photo tutorial by Alessino on Flickr. This is a quick and easy way to create one-of-a-kind texture sheets from your own original drawings or images created with computer graphics software. You can even turn a child's drawing into a custom texture sheet. Trace over your design with dimensional fabric paint or 3D craft paint from the craft or sewing store and cure it without heat according to the manufacturer's directions. You can use dimensional fabric paint or any other type of 3D paint that comes in a squeeze bottle or tube with a pointed applicator-type tip so you can squeeze out lines of paint. Allow the paint to dry/cure at least 24 hours to make sure it won't contaminate your metal clay. Note: Some brands of dimensional paint squeeze out thinner vs. thicker lines. You can control the thickness somewhat by how much pressure you apply as you squeeze out the paint and also by how slowly or quickly you trace the paint over the lines of your drawing. Scribbles 3D Fabric Paint bottles have thin nozzles that allow you to create comparatively fine lines of paint. You may want to try out a couple of other brands, too, if you want to add a couple of bottles that have a larger hole for squeezing out the lines of paint. For the best results, use a dimensional paint with a smooth finish, such as shiny, metallic or pearl. To use these texture sheets, lightly oil the surface of the clay rather than applying a clay release agent directly to the texture sheet. 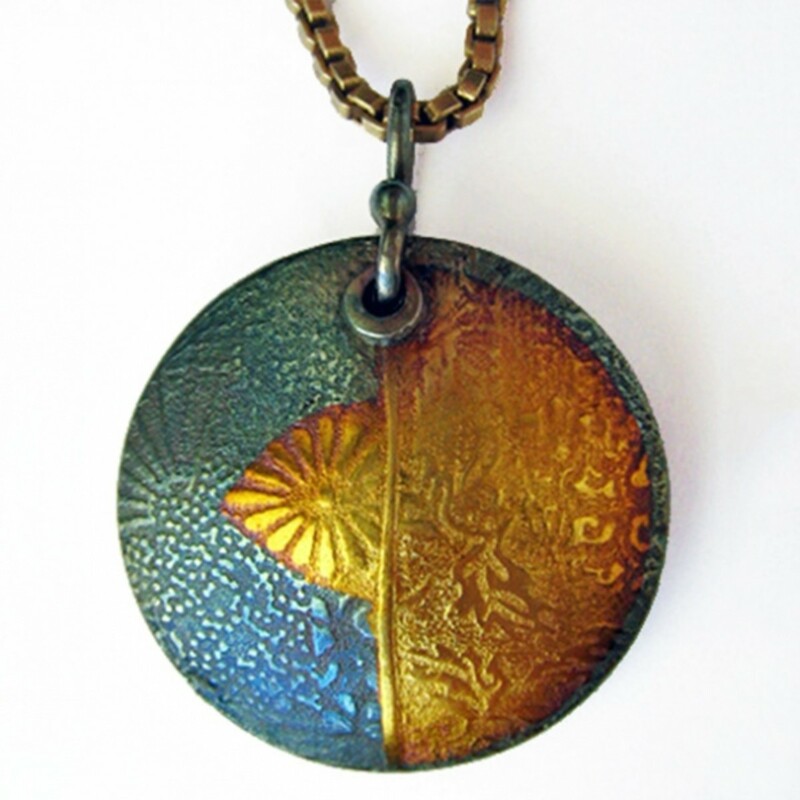 French jewelry artist and instructor Sabine Alienor Singery uses a variation on this technique (rolling a thick sheet of polymer clay across a cured dimensional paint design and then peeling off the clay and curing it) to create texture sheets that will impress raised designs onto the clay. (I would suggest dusting the dimensional paint texture sheet with cornstarch as a clay release before rolling the polymer clay sheet over it.) This is a great way to create cloisonné-like cells on metal clay pieces that can be filled with your choice of other media - resin, polymer clay, dimensional glass paint (such as Gallery Glass by Plaid), concrete, epoxy clay, etc. - after firing. Check out Sabine's excellent tutorial with step-by-step instructions provided in both French and English. If you're trying this dimensional paint texture sheet technique (either variation) for the first time, you may want to start with a small bottle of dimensional fabric paint to see whether you enjoy the technique. If you're planning to make a lot of textures this way, the larger bottles or multi-packs are much more economical. The multi-packs also let you use or combine different colors of paints on your textures, which makes them more fun to use. Or you could use different colors to color-code different types of designs, e.g., abstract, geometric, nature, Zentangle. Experiment and have fun! If your design is not symmetrical, you'll need to paint over a mirror image of your drawing so that the impression of the design in the clay faces the correct way. If you created your drawing with a graphics program, you can use the same program to reverse the image (flip it horizontally) and then print it out onto the glossy photo paper or transparency film. You can also draw the image by hand or print it out from the graphics program onto a sheet of transparency film and flip it over. Either apply the paint directly to the back of the transparency or photocopy the back (unprinted side) onto the glossy photo paper to get a copy of the reverse image. Artist, author and instructor Patrik Kusek came up with a neat idea for texturing clay to simulate granulated metal. He posted a video demonstration of how to make a granulation texture sheet on his blog. The "glitter" actually is tiny glass microbeads, and the basic technique involves taking a drawing or a printout of the desired design, tracing over the design with white glue, pouring a thick layer of microbeads on top and then pouring off the excess beads. After the glue dries, impress the microbeaded texture onto a slab of two-part molding compound metal clay, so that the bead balls protrude from the clay instead of being impressed into it. This video shows how to carve a stamp intended for printing, but it's also a great technique for carving a texture to impress in metal clay. Impressing or molding isn't the only way to add great textures. Try adding more clay to your clay! Metal clay shavings or gratings. When you carve dried metal clay, save the shavings. Alternatively, take a bone-dry piece of clay and grate it on a cheese grater or something similar, or shave off pieces with a tissue blade or old vegetable peeler. Paint a generous amount of paste clay onto your piece and sprinkle heavily with the shavings. Press them into the paste to make sure they adhere well. Paste clay textures. Paint a thick layer of paste clay onto your piece and texture it while still wet. You can use a spatula like a frosting knife to create stucco textures, or draw a lightly-oiled pin tool or comb through it, just for starters. Syringe textures. Syringe clay embellishments are a great way to add texture to your piece. Dots, parallel lines, crosshatchee latticework, filigree-like curlicues - these are just a few of the ways to add texture to your piece. Slip trailing. This is a decorative technique borrowed from the world of pottery. It creates a result somewhat similar to syringe but much more organic, with softly rounded edges, since the slip is a bit thinner than the syringe clay and doesn't hold its shape as precisely. It's almost like "painting" with slip, except that only the slip itself, and not the brush or other applicator, touches the greenware on which it is being applied. Slip trailing is best done with slip about the consistency of heavy cream. If it's too thick, it leaves points where the applicator is removed and can't be pulled out into a thread to make thin/delicate lines. If it's too thin, it spreads out too much (and may not have enough viscosity to hold together when you try to draw it out into a thread). To learn more about slip trailing with metal clay, I highly recommend the chapter written by Terry Kovalcik called "Developing Form with Slip" in the excellent book, PMC Technic, which in my opinion is one of the best books on metal clay ever written. Metal clay veneer. Jay Humphreys invented a unique Metal Clay Veneer solution (formerly called PMC Veneer solution) that can be mixed with metal clay and poured onto textures and cured to create flexible, textured sheets of metal clay. You can use them for embellishments, bezels, and much more. You can purchase a Metal Clay Veneer Starter Kit (which contains one 2 oz. bottle of veneer solution, two 2 oz. mixing bottles, 1/2 oz. gold mixing bottle, two 1 oz. measuring cups, two stirrers, a Metal Clay Veneer CD, and a printed instruction sheet) as well as a Refill Kit for Metal Clay Veneer from several of the major metal clay suppliers' sites. Metal clay appliqués. Cut or punch shapes from PMC+ sheet or Art Clay Silver paper type metal clay. To attach the appliqué cutouts to rolled-out or shaped fresh lump clay, moisten the underside of the cutout very lightly by brushing on water sparingly, taking care not to get any moisture on the top of the cutout. Apply the moistened shape to the fresh metal clay and press it down with a barely oiled fingertip or paintbrush handle to adhere it. You also can apply the remainder of the metal clay paper/sheet (negative image) onto rolled out lump clay to create recessed areas where the paper was cut or punched out. If desired, these recessed "cells" can be filled with enamel, resin, etc., after the clay has been fired. To apply metal clay "paper" cutouts to dried clay (greenware), moisten the attachment area on the greenware and allow the water to absorb for a few seconds to reactivate the binder in the clay. Then attach the appliqué as described above. Using a Silhouette CAMEO electronic cutting tool is the newest and most precise way to cut out uniform shapes from silver metal clay sheet (AKA paper type), thin sheets of PMC Flex clay or flexible base metal clay formulas such as original BRONZclay to use as clay-on-clay appliqués, and the remainder of the metal clay sheet after the cut-out pieces have been removed can be bonded to a plain/solid backing sheet, which is another great way to create recessed areas with straight walls that can be filled with enamel. Design custom appliqué shapes, cut them out from the clay sheet with the Silhouette CAMEO. Wanaree created some Silhouette CAMEO video tutorials courtesy of Metal Clay Artist Magazine where she demonstrates how to use the Silhouette Cameo with metal clay. Then attach them to metal clay greenware using metal clay slip, oil paste, or extra-strong paste made with Sherri Haab's Paste Maker solution. 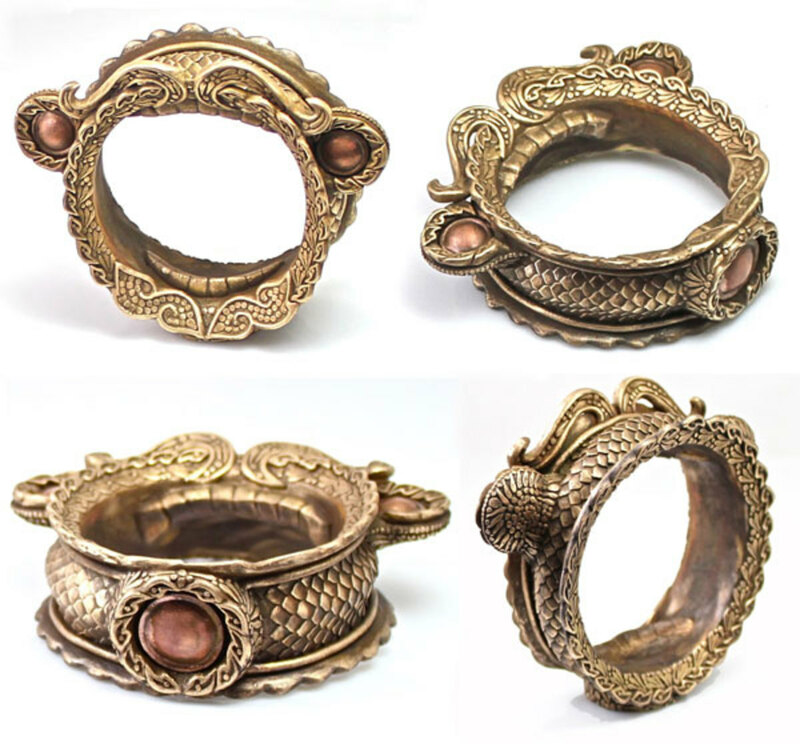 The incredible texture on Wanaree's fabulous "Gate at the Garden of the Gods" bracelet,shown above and also featured on the cover of the third anniversary issue of Metal Clay Artist Magazine Vol. 3 Issue 3, was made using bronze clay sheet appliqués cut out on the Silhouette CAMEO and painstakingly applied one at a time. You can roll out a slab of clay a bit thicker than you want the background of your piece to be, top it with a stencil or shape cutting template (to which you've applied a light coat of clay release agent) and roll again using the same thickness spacers. The shaped opening in the stencil or template will remain the same height as the original slab and the surrounding area will be pressed lower and thinner by the thickness of the stencil or template. The following Gingko Pendant Project video demonstrates this process. Carve dried metal clay with very small woodcarving or linoleum gouges.These tools come in a variety of sizes and shapes. For carving metal clay or polymer clay I recommend the smallest size tools, from 1.25 mm to 2 mm for most purposes, and up to 3 mm if you like to make very wide carving cuts. Buy the best quality you can afford and take good care of them and they'll last you for many, many years. I and many other metal clay artists use and love Dockyard micro carving tools. Unfortunately, the gentleman who makes them intends to cease production late in 2014 unless he finds a buyer for his business. Another option recommended by Celie Fago is Namisei Moku Hanga To Japanese wood carving tools, available from McLain's Printmaking Supplies, in the smallest sizes offered, 1.5 mm and 3 mm. Original BRONZclay and COPPRclay and other metal clay formulas that retain some flexibility after drying also are excellent for carving. However, it is possible to carve any metal clay. Clays with lower proportions of binders will tend to chip more readily, so try carving pieces made from those clays when the clay is mostly dry but not completely dry, taking care to support the piece gently but well and using the least amount of pressure necessary to avoid having the piece collapse because of the remaining moisture. For helpful tips, read Celie Fago's excellent blog post about carving directly into dry metal clay and carving cured polymer clay to create your own unique texture sheets, which also discusses the pros and cons of various different types and brands of carving tools. Files can be used on dry metal clay pieces to form gouges, depressions, and other interesting surface textures. Some interesting surface textures can be created by drilling depressions (or even holes) in the dry clay. Beautiful surface textures can be created by applying a non-water-soluble resist, such as nail polish or wax, on dry metal clay and then removing clay from the exposed areas by wiping with a damp sponge or moist towelette or baby wipe. Jewelry artist Catherine Davies Paetz published a terrific how-to article about this technique in the September 2006 issue of Art Jewelry Magazine. You can purchase a PDF download of her water etching article "Water Works" from the magazine publisher. Jewelry artist and metal clay instructor Lora Hart also published a great water etching project, "Butterfly Bead", in the September/October 2006 issue of Lapidary Journal's Step by Step Beads. You also can download a PDF of PMC Studio magazine, Summer 2004, Volume 7, Number 2 that contains CeCe Wire's article, "Water Etching with PMC+" from the PMC Guild archives on the Rio Grande site. Weave PMC Sheet or Art Clay Silver Paper Type Clay into Woven Metal "Fabric"
You can roll out thin sheets of any type of metal clay and cut them into strips that you can weave (remember weaving potholders from fabric loops when you were a kid?). But my favorite way to weave metal clay is with strips of fine silver metal clay "paper" sheet. Then the woven "fabric" is backed with a rolled slab of regular ("lump") silver metal clay. Depending on the shrinkage rate of the silver clay used for the backing sheet, you can create curved or domed effects, if you wish. I've written a detailed metal clay weaving tutorial that contains step-by-step instructions and illustrations for how to weave metal clay paper or sheet type into fine silver "fabric." 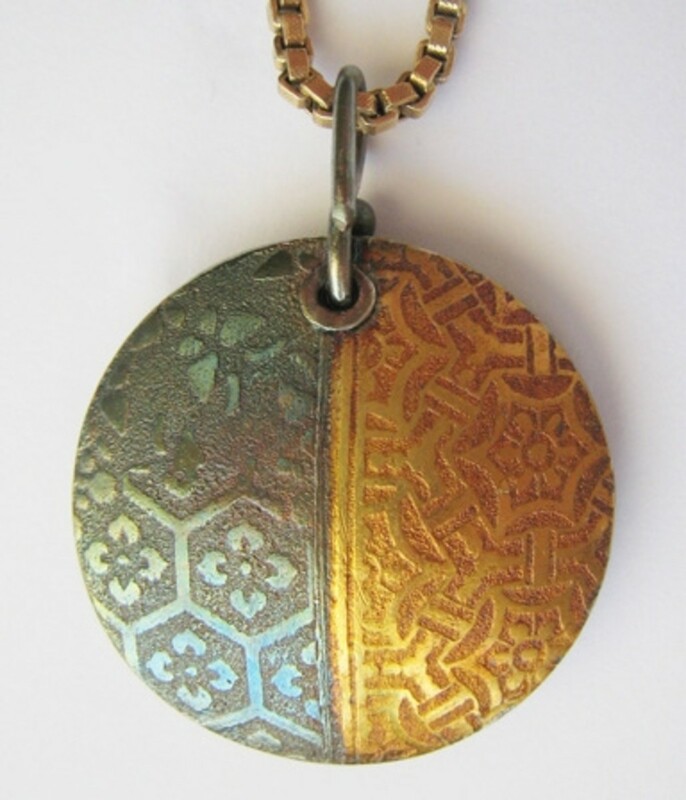 What's Your Favorite Way to Add Texture to Your Metal Clay Jewelry, Sculptures, Etc.? - Metal clay just begs for texture! Which texturing methods do you use most often? Making your own texture plates or texture mats - photopoymer plates, carved rubber or baked polymer clay, etc. Adding metal clay balls, shavings, ropes, etc. In addition to textures you can make or find around the house or in nature, there are many, many ready-to-use rubber stamps,, texture sheets, metal stamps, paper punches and other tools and supplies that you can use to texture your metal clay. pieces. When choosing commercial texture sheets, in addition to looking for designs and patterns that appeal to you, also look for even depth and good definition that will leave a crisp impression on the clay. Flexible Silicone Texture Sheets, Mats, Tips, Etc. Commercial textures are extremely popular and for good reason. There are some really terrific patterns available in these flexible texturing mats and tips. Some of my favorites are Cool Tools' Texture Texture Tiles and Texture Tips, Victoria James Art's Real Textures sheets, Lisa Pavelka Signature Series textures and Helen Breil texture stamps. Brass texture plates create a subtle, low-relief texture that works well for keum-boo (diffusion-bonding gold foil to the surface of your fired fine silver piece with heat and pressure). Rubber stamps are a great source of textures. They come in a huge variety of sizes, shapes, depths and styles to suit any taste and project, and they're readily available. They can be used mounted or unmounted. Use an appropriate release on the stamp before impressing it on your metal clay. I prefer either olive oil or Cool Slip (by Cool Tools). These are comparatively inexpensive and both sides can be used so you can create positive/negative textures with them. Some brands include Shade-Tex, Roylco, Makins and Fiskars. 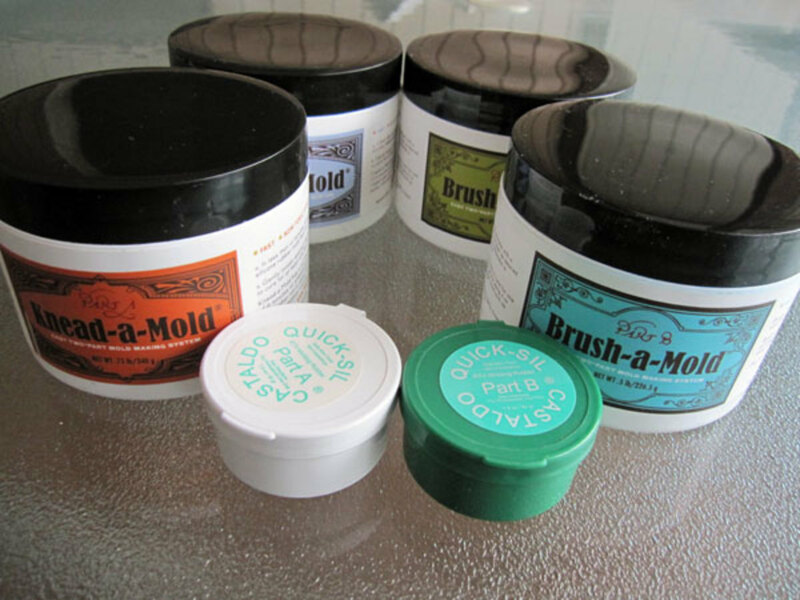 You can purchase push molds designed for polymer clay if you use an appropriate metal clay release (olive oil, Cool Slip, Badger balm, etc.). However, most of these are not flexible and it can be difficult to remove the clay unless you allow it to dry in the mold first so it shrinks a bit. There are flexible silicone candy molds you can use (again, coat these with a release first) that have lovely designs. Office supply stores and craft or scrapbooking stores carry magnetic alphabets you can use to create custom words or messages on a metal bar and then imprint on your clay. A clay extruder resembles a cake decorating gun designed for icing cakes and works on the same principle. The barrel is fitted on one end with a metal cut-out shape disc or die and filled with softened metal clay or polymer clay. A cap with a plunger is attached to the other end of the barrel and the plunger is depressed by means of a trigger or twist handle. The clay is extruded through the die in strands matching the contour of the cutout. Extruder barrels can be difficult to clean, and especially when you are working with precious metal clay you want to conserve every last bit of clay possible. Also, if you want to use your extruder with both metal clays and polymer clays, it is essential that you clean it meticulously before switching from one type of clay to another. I want to share with you a neat trick I learned from an article by well-known polymer clay artist Lisa Pavelka in the Winter 2012 issue (Vol. 3, Issue 1) of Metal Clay Artist Magazine. Although the article, now on Cre8tiveFire.com, was about making extruded mosaic canes from polymer clay that can be used to fill fired metal clay bezels or frames, the method Lisa shared for keeping the interior of the extruder barrel clean works equally well when extruding metal clay. Start by rolling a thick log of clay the same width as the interior diameter of the extruder barrel, as usual. Then use scissors to cut a 2" x 4" (50 mm x 100 mm) rectangle of plastic wrap and place the clay log along one of the long edges of the plastic, aligning one end of the log flush with the short edge of the plastic so that end will remain exposed as the clay is wrapped. Roll the log snugly inside the plastic wrap, which should wrap around the clay log 1½–2 times. Twist the loose plastic tightly against the covered end of the log as if it were a candy wrapper. Then slide the wrapped clay log into the extruder barrer so that the end covered in plastic is pointing towards the plunger. Screw on the desired disc (AKA extruder die) and the cap. The clay will be extruded through the open end of the plastic wrapper without touching the interior walls of the barrel. PMC sheet and Art Clay paper can be embossed using punches designed to emboss paper. Crafts and scrapbooking stores carry many different embosser designs, some of which have coordinating paper punches. Emboss first, then punch out the shape. Several manufacturers make carved rolling pins in acrylic, polyacrylic, wood and other materials. Most of these create deep relief textures in the clay. And like all textured rollers, these have the advantage of allowing you to texture a slab or strip of clay as long as you need - for example, for the wall of a round box or for a large bezel. To use these textured rolling pins, roll out a plain slab or strip of metal clay two cards thicker than you want the textured sheet to be. Apply a very thin layer of olive oil to the surface of the clay or spritz the roller evenly with Cool Slip. Replace the taller thickness spacers with rolling slats or spacers of the desired finished height. To get a crisp, continuous pattern impression, place the textured rolling pin on one end of the slab with both ends of the roller resting on the spacers. Holding both hands side-by-side with your fingers straight forward and parallel to the clay, place your fingertips on the center of the roller and move your hands forward with even pressure in one continuous motion without starting or stopping until you reach the far side of the slab or until the rolling pin has reached the heel of your hand. Once you have found, made or purchased your textures, here are some tips for using them with metal clay. There are two ways to create a double-sided texture on a sheet of malleable metal clay. The best way to create a sheet of metal clay that's textured on both sides is to roll out a slab of clay a bit thicker than you want the finished sheet to be after it is textured and to sandwich it in between two textures separated by spacers of the desired finished thickness/height. Rolling across this "sandwich" impresses the textures on the front and back of the metal clay sheet simultaneously. Unless there is a particular reason for texturing two pieces separately and then joining them back-to-back, it is much quicker and cleaner to texture both sides of the clay at the same time. The most important thing to remember when doing two-sided texturing is that you need to account for the depth (not the thickness) of both texture sheets as well as the desired thickness of the textured clay in the recessed areas (not the raised areas) of the texture. The recessed areas will be the thinnest spots on the textured sheet and therefore will determine its strength. Let's say you want to texture both sides of a sheet of metal clay with tear-away textures, which usually are about 1 card deep (or 2 cards total), and you want the textured clay to be 3 cards thick after texturing. Roll out a sheet of clay 5 cards (1.25 mm) thick, which takes into account the 2 cards (0.5 mm) total depth for the two textures and 3 cards (0.75 mm) of desired clay thickness after texturing. Apply a release agent such as olive oil, Cool Slip or Badger balm to both textures, making sure it gets into even the tiniest crevices. Also apply a thin film of olive oil to one side of a piece approximately 3" x 4" cut from a page protector sheet (from an office supplies store). Place the bottom texture sheet with the oiled side face up and lay the rolled-out sheet of clay on top of it lightly. Place spacers three cards thick on top of the texture sheet to the left and right of the clay sheet, leaving some space between the edges of the clay and the spacers. Lay the page protector sheet oiled side on top of the clay. Roll across the clay on top of the texture with a clay roller. Use even pressure in a single, smooth motion to roll from the front edge of the texture sheet away from you to the back edge and then toward you back to the front edge. Press firmly but not so hard that the roller touches the thickness spacers. Peel off the page protector sheet, then lay the top texture sheet face down on top of the clay, making sure that both the left and right edges are resting on the two 3-card spacers. Roll across the clay firmly in a single, smooth motion as before. Carefully peel the top texture sheet away from the clay, then carefully peel the textured clay away from the bottom texture sheet and lay it on a nonstick work surface. As you peel off the clay from the bottom texture with one hand, use the other hand to support it from underneath to avoid distorting the texture. Wet the backs of both pieces with a light wash of water, hold them back to back and slightly separated, align them perfectly, then put them together and apply even pressure while using a very small wiggling motion. The combination of the water, pressure, and the slight wiggling motion creates a tiny amount of slip between the two pieces that will thicken and "grab" very quickly — a technique jewelry artist and author Kate McKinnon refers to as "squidging". I recommend using this method only on smaller components. 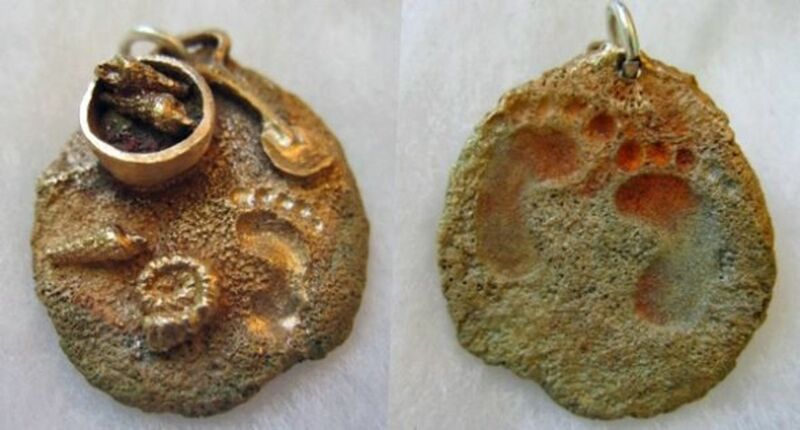 Adding a liver of sulfur or other patina and then polishing the surface of the metal to remove it from the raised areas is an effective and popular technique to bring out the details of the texture on a fired metal clay piece. Liver of sulphur comes in both dry chunk and gel forms. The dry chunks have a very limited shelf life, but I prefer them for preparing a solution for a colored patina. For a traditional dark gray-black LOS patina, I recommend the stabilized gel form that has a much longer life. It's also extremely concentrated, so just a tiny amount is enough to prepare a cup or even two of patina solution. Either form of LOS should be mixed thoroughly with extremely hot but not boiling water to avoid releasing sulphur dioxide gas. 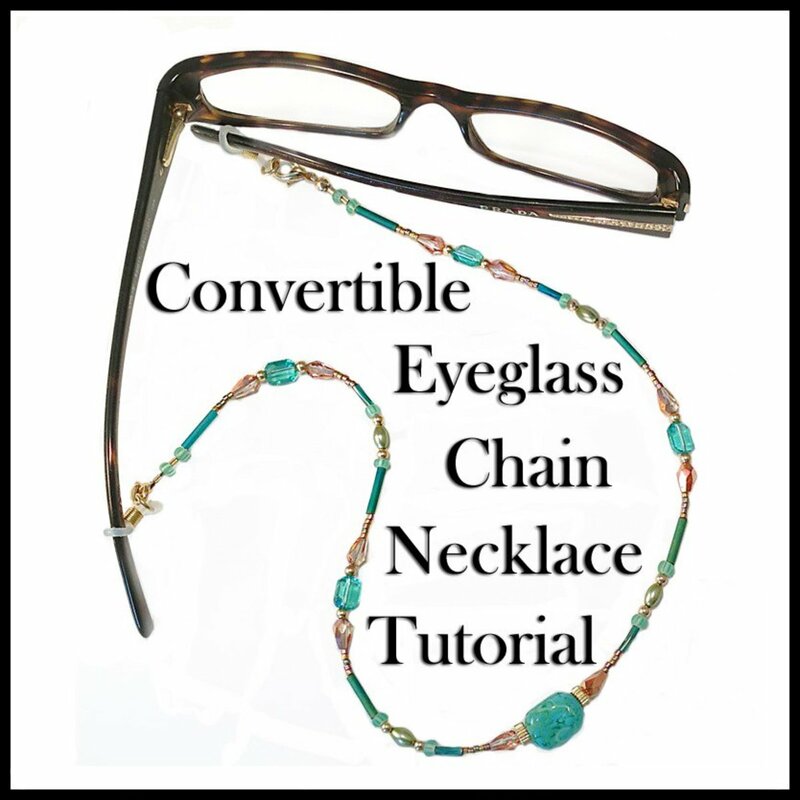 Make a Pretty Beaded Eyeglass Holder That Converts to a Necklace! Was This Article on Metal Clay Textures Helpful? Did You Learn Something New? This is the most comprehensive page!! Thank you for all your tips and tricks. Super happy to find this! 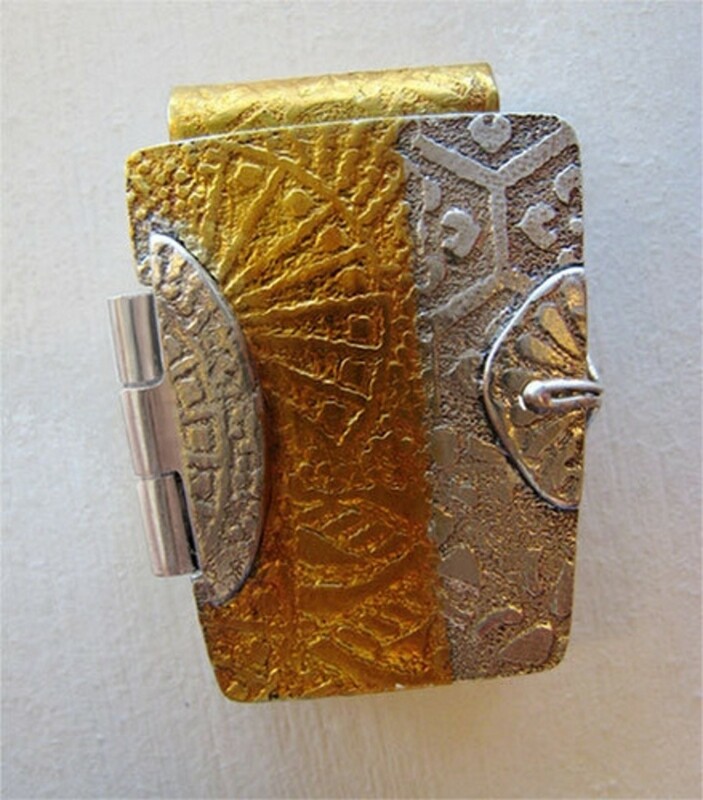 @Jenny ekberg, embossed paper is a great choice for texturing metal clay. I especially like textured wallpaper samples. Thanks for your visit and your comment! My favourite is 3D printed/embossed paper. Hi Patrice, thank you SO much for your wonderful feedback! I'm so happy to hear that you, as an experienced metal clay instructor, find my article on creating metal clay textures so helpful that you will recommend it to your students as an authoritative resource. I'm very appreciative of your kind words. Thank you for having put together such an all- encompassing collection of techniques. I've been teaching Metal Clay for quite some time, and you have inspired me to better collate my notes, and now I can send my students to your work when they start to feel overwhelmed with the amount of info available. You have it all, so organized and thorough. Thank you!!!! @Trish Jeffers-Zeh - Thank you so much for your wonderful feedback, Trish! You, too, are so generous with your wealth of knowledge and are a true gift to our metal clay community. WOW! I am always so impressed with what & how much you share. This is a spectacular article so packed with info I could be busy with projects for days. Thank you for being the keep of all tid-bits & information & then passing them on for others to be enlightened. You are a gift! Thank you so very much Margaret for your very kind words, I really aprpeciate it. Lots of times when I write an article or tutorial I never hear any feedback until I meet the person in person. I'm happy to hear that you like the book. I'll give your suggestion some thought. Margaret, this is so informative! You really laid out all the instructions and materials needed. I really like the sea shell. It's beautiful! Sandy, if you ever decide to try making metal clay jewelry please don't hesitate to ask for help. I'd be happy to give you tips and pointers and help you troubleshoot if you have any problems! This looks like something that I would like to try, when I find some time. Very interesting and craft. Thanks so much for your lovely feedback, Lorelei! I'm delighted that you find my tutorials helpful. Your jewelry craft tips and tutorials are always so very helpful. Thank you for another excellent post. @MarleneB, thank you so much for your lovely compliment! I had a lot of fun designing and creating those little kimono earrings for my sister. 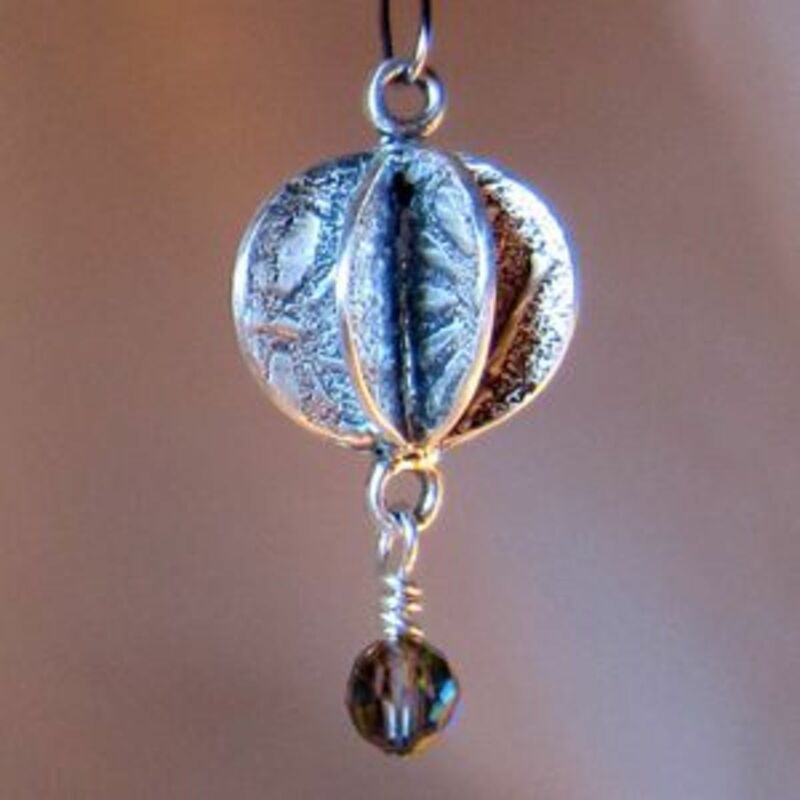 Metal clay is a unique way of working with metal and finding new, interesting ways to add texture to jewelry designs makes it a very satisfying material. I really appreciate your kind words and I'm glad you enjoyed learning more about this versatile jewelry making material. You have extreme talent! Those little Kimono Earrings are adorable. 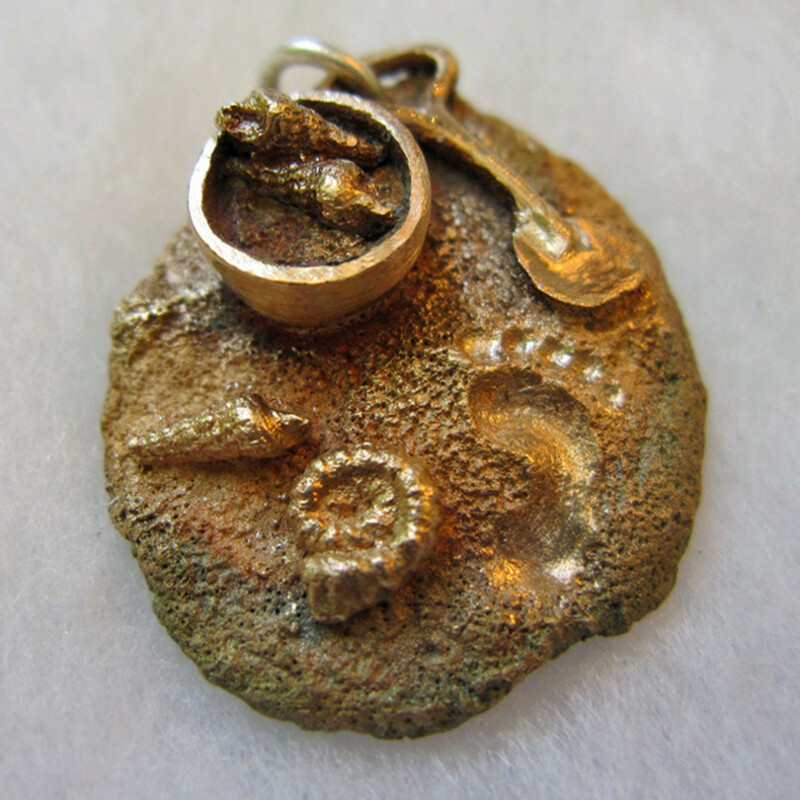 I enjoyed reading about metal clay textures and the vast number of things that can be done. Your tutorial is excellent. Lori, what a wonderful and very personal gift for your Mom's caregivers! Having been in a similar situation with my own Mom, I know what angels they can be. Handmade jewelry is such a special gift of the heart, isn't it? As always, your jewelry articles serve as inspiration. I don't use metal clay but regular clay and a wheel to create some pretty neat stuff. I recently cast my Mom's hair clip (a beautiful butterfly) to use on some of my pieces I'm giving to the caregivers who were so instrumental in keeping Mom and me sane. Thanks so much, @imsevenofnine4! I'm always excited to share my metal clay expertise and experience with others. I'm delighted that you find my article informative and inspiring. Awesome post! I learned so much reading this. I have considered making some pendant this way for a long time. Your information makes me want to get started today! Barbara, your wonderful comment totally makes my day! I'm very grateful for your enthusiastic feedback and kind compliment. Big hugs to you! This is incredible Margaret, you are without a doubt an expert at your craft - the jewelry is beautiful and I can imagine anyone looking for a tutorial will be helped tremendously! My gawd you've put a ton of work into this one. Superb. Deserves Hub of the Day too. Incredibly helpful for one switching from traditional metalsmithing to metal clay work. A digestable reference I'd like to always have on hand. @David Stone1: Thank you so much for your extremely kind words, Dave. My joy in continuing to learn and refine my repertoire of metal clay skills and best practices is equaled by my joy in sharing my acquired knowledge with others who may be interested in working with this extraordinary material. Wow! Your commitment to excellence extends to the way you present your information. This is a manual really that should be between covers as a training and reference guide to metal clay. 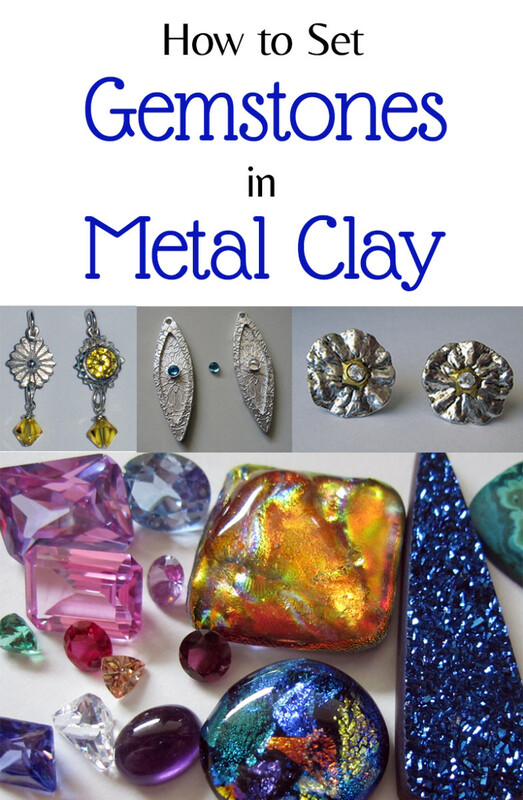 This truly is the ultimate guide for working with metal clay! I've always been interested in this as I see it at the craft shop all the time. Thank you for showing us your beautiful designs! I'm impressed. This is such a fantastic lens! Your jewelry designs are beautiful! your lens is nice and has a very unique information about metal clay. @chiconsquidoo: I'm glad you found this tutorial valuable! @mbgphoto: Thank you so much for your kind feedback and angel blessing! Fabulous ides. I need to pass this on to my daughter. She could use some of these ideas for the pottery she makes too. Blessed! This is an amazing craft article. I've never heard of metal clay before, but the things you have made are stunning. Nice looking lens. Someday I hope to be able to stay home from a regular job and do creations like this. It looks like so much fun. Thanks for the information. @anonymous: Thanks so much, Tipi! I really appreciate your return visit and your angel blessing! Well, I'm sure glad I peeked back in on this wonder...was sure I had left a blessing....so here it is now....catch the angel dust! @Diana Wenzel: Thank you so much for your wonderful comment! 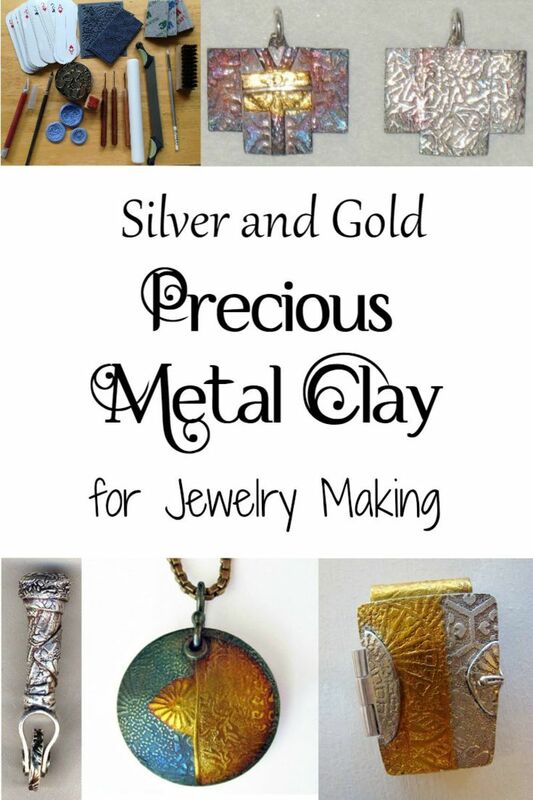 I'd be delighted to help you get started making metal clay jewelry. Just let me know if you have any questions! Stopping back by to get inspired. Really want to try my hand at creating some metal clay jewelry. Enjoyed this artful presentation just as much the second time around. Happy New Year! @floppypoppygift1: Thanks so much for your wonderful feedback! I really appreciate it. @indigomoth: Thank you so much for your awesome comment! I'm extremely grateful to you for your very kind feedback. This is an amazing, inspiring lens. Thanks for all your hard work! @radhanathswamifan: Thank you very much for your lovely comment! @Thomo85: Thank you! There are a wide range of different metal clay types and formulas available, and I use several different ones. 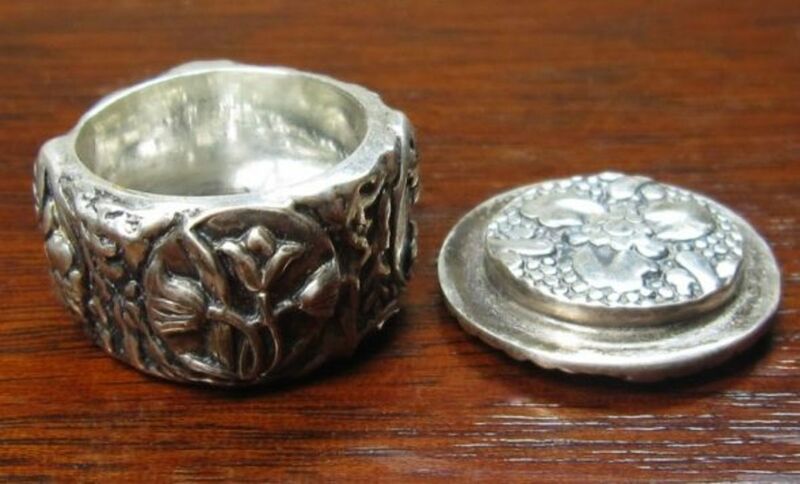 In fact, there are quite a few formulas of fine silver metal clay, copper metal clay, and bronze metal clay, as well as several steel clay and a couple of gold clay formulas, and one sterling silver clay and one brass clay formula. 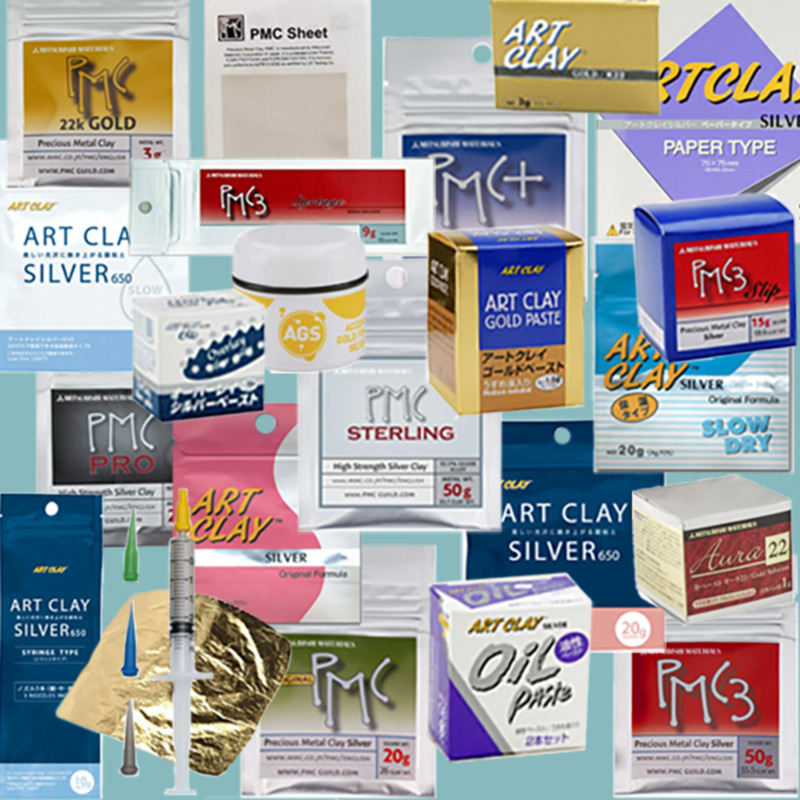 Widely used brands and manufacturers of various different metal clay types and formulas include PMC (Mitsubishi), Art Clay (Aida), Original BRONZclay, FASTfire BRONZclay, and COPPRclay (Metal Adventures), Meteor, Hadar's Clay (Hadar Jacobson), Goldie Bronze (Waldo IÅowiecki), and Metal Mania. The last three brands come in powdered form and are reconstituted with water into usable metal clay as needed. I hope this helps! Love these metal clay effects you have in this lens, what type of clay are you using exactly. My wife makes nice polymer clay jewellery, I am more into sculpture. @Melissa Miotke: Thanks so much for your wonderful feedback! I'm so glad you are finding it helpful. This is detailed and helpful. Great lens! @ItayaLightbourne: Thank you so much for your wonderful compliment and your SquidAngel blessings! I'm deeply grateful for them both. @crimsontide2010: Thank you so much for your very kind words! I am touched and very grateful. May God bless you with all of your endeavors with squidoo!! I really enjoyed this lens.... look forward to many, many more. You're very talented with your crafts. @jtbmetaldesigns: Thanks so much for your great compliment! I'll check out your lens on acrylic painting mediums. Your work is gorgeous! I particularly like the silver and ruby pendant. 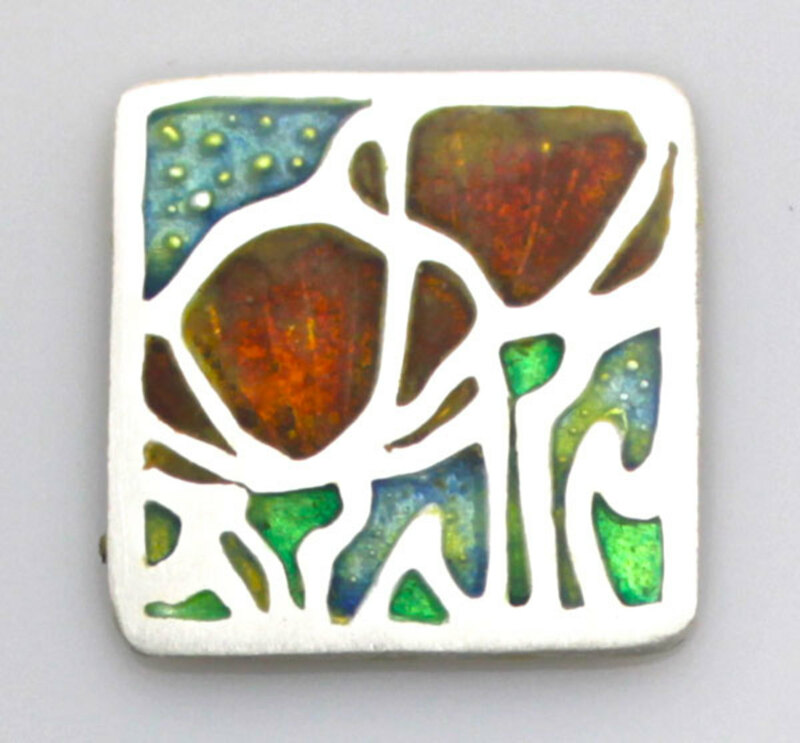 My brother's girlfriend has produced some lovely brooches and pendants using metal clay. I haven't tried it yet, but it's on the list, and this lens definitely bumped it up a notch or two. I love the idea of making my own molds and textures! Very cool ideas. I would love to do this sort of thing. Thanks for creating this lens. Those are beautiful designs. I have to come back here and try some of these. I haven't done this before but am intrigued. @TolovajWordsmith: You're very welcome! Thank you for the thumbs up and for the lovely feedback! @anonymous: Thanks so much for the wonderful feedback, Tipi! I really appreciate it and I'm delighted that you found this lens helpful. I really want to try this some time. Thank you so much for all the information, very helpful. @Gypzeerose: Thank you so much for your wonderful comment, your SquidAngel blessings, and pinning this lens to your board "Arts and Crafts I love". I'm very grateful to you! Very detailed - wonderful lens. Blessed by a Squid Angel and pinned to my board "Arts and Crafts I love." Wow - absolutely beautiful! Thanks for sharing! Blessed by a SquidAngel!